A fine sunny morning for our last day. 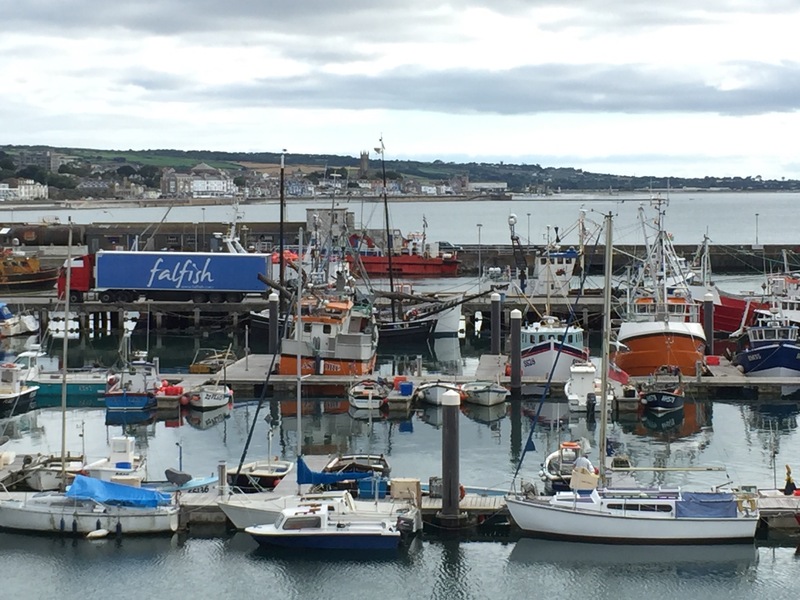 After a full breakfast we stepped out of the B&B straight onto the coast path and we quickly reached Newlyn to pass the fishing harbour. 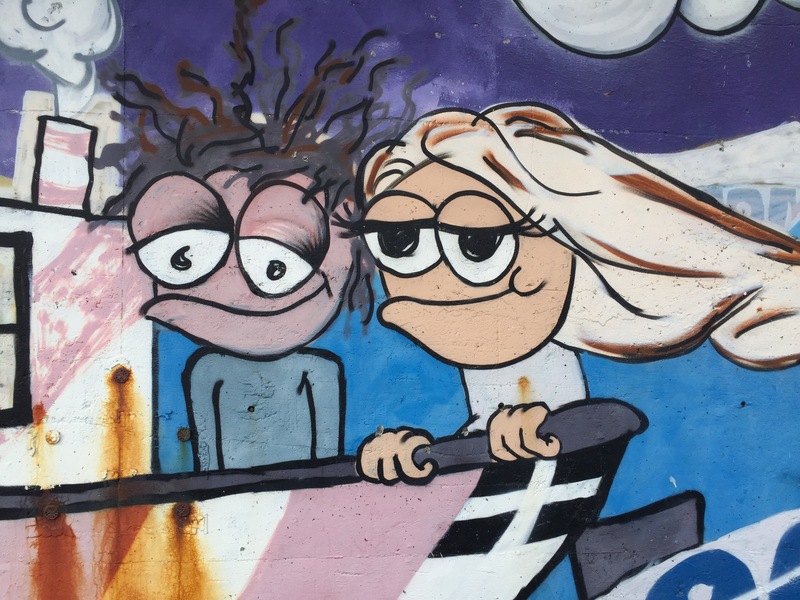 The local graffiti artist had captured us well. 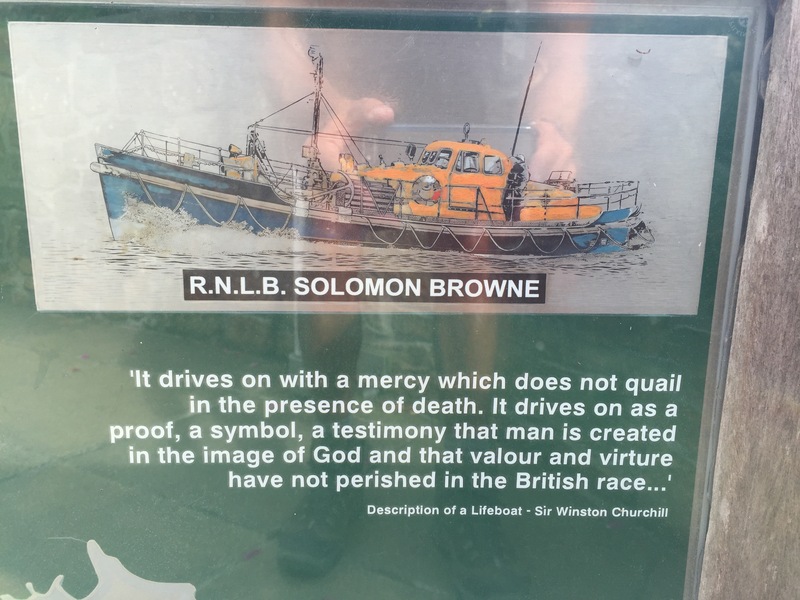 We headed towards Mousehole passing the memorial to the crew of the Soloman Browne, the Penlee lifeboat. 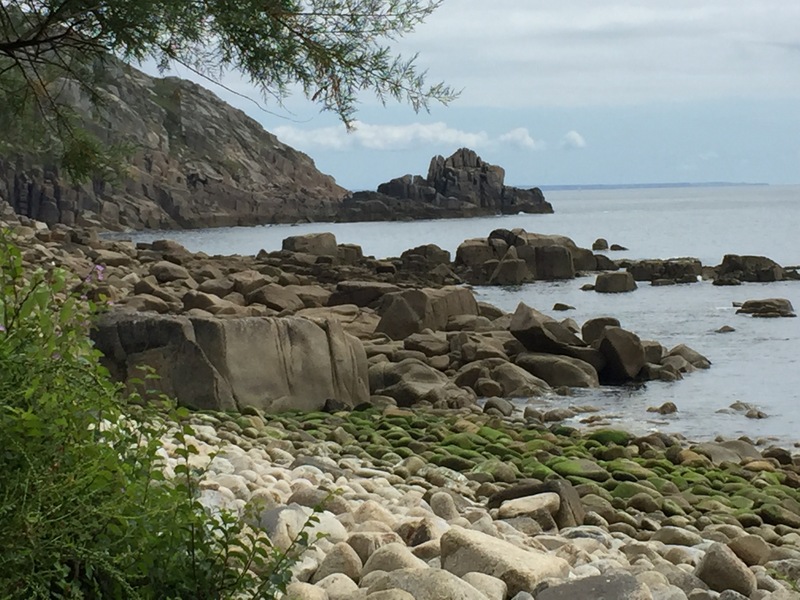 We passed through Mousehole and had our only tea stop of the day at Lamorna Cove. 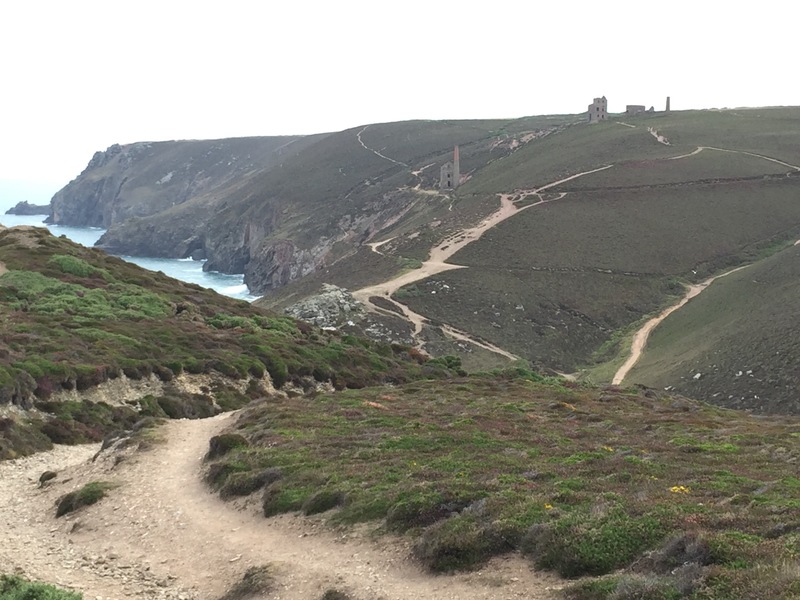 We reached Porthcurnow and the Minnack Theatre. The show on this week was ‘The Titfield Thunderbolt’ which was sort of appropriate given the number of steam railways we have passed and the old railway lines we have walked along. For the benefit of readers who will not have seen the 1953 film starring Stanley Holloway, probably everyone apart from our Dads, the story concerns a village trying to stop it’s railway being closed. 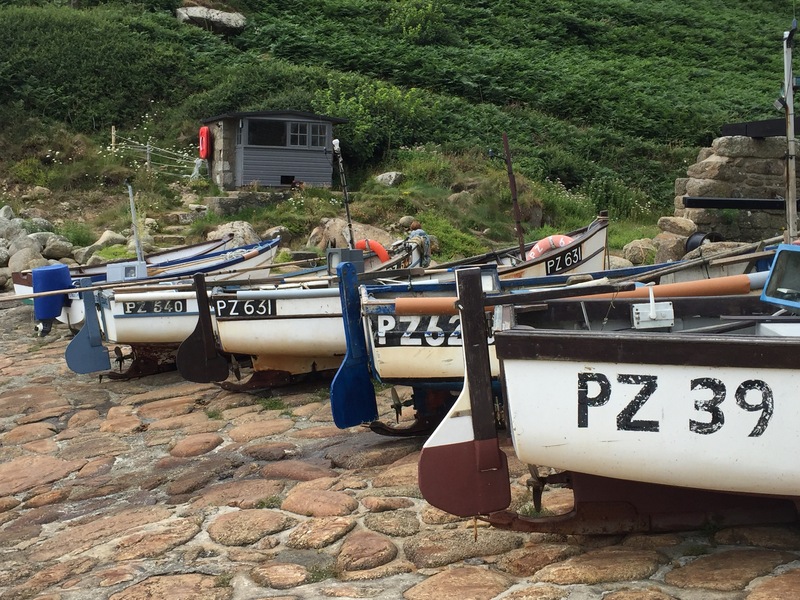 We stopped for lunch and carried on through Porthgwarra a pretty unspoilt little slipway with a few fishing boats. 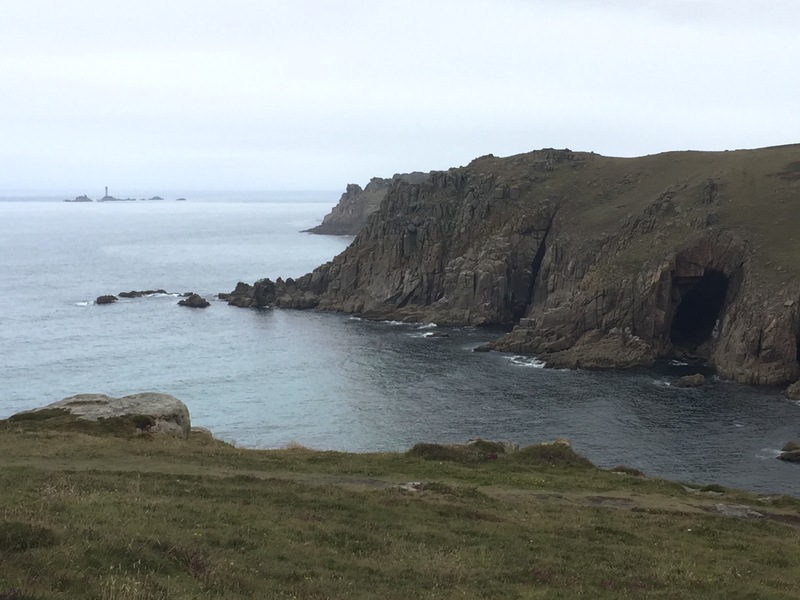 We soon got our first glimpse of Land’s End in the distance. About a mile out we stopped and had a hug as the emotions caught up with us. Lynn put her sunglasses on even though it was now getting overcast and drizzly and Steve got the grit out of his eye. 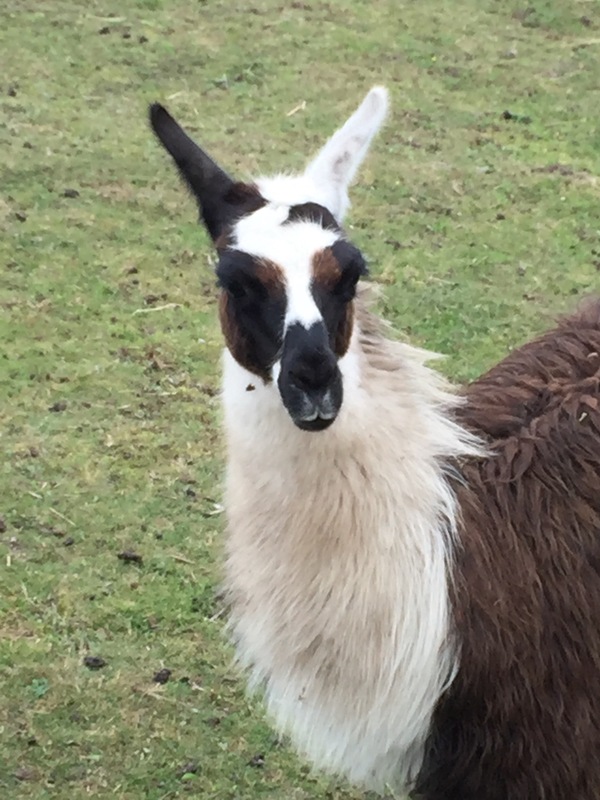 Just short of Land’s End are a few fields with animals in including llamas which made Steve’s day, at last the pack animals he had been searching for – typically too late to be of any use carrying his rucksack. 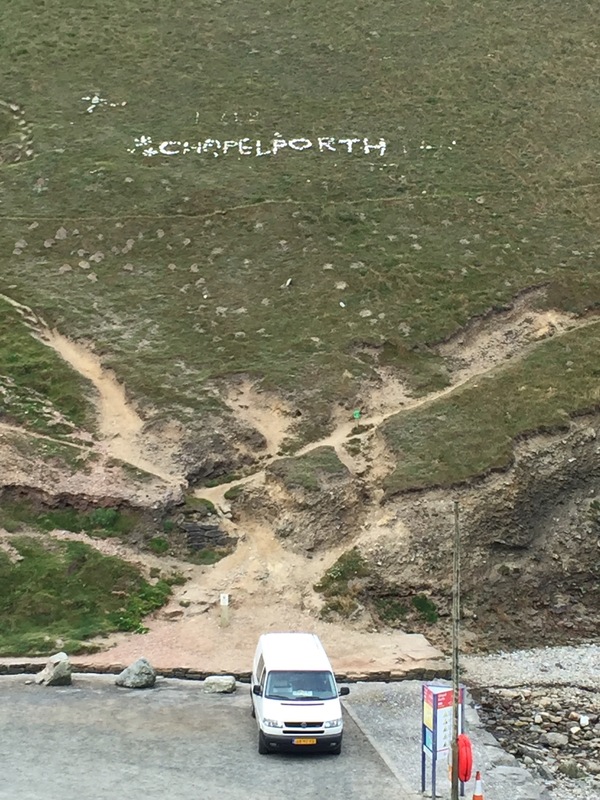 We reached Land’s End to be met by Geri, Ryan, Alexander, Sandra and John who we had met yesterday. They had generously brought some fizzy and chocolate cake so we were able to celebrate in style and have the obligatory finish post pictures. A special thanks to them for meeting us on what was becoming a wet and quite cold day at Land’s End. A little tiddly we were dropped back to our B&B for a well earned and needed bath. Writing this blog has been a joint effort. Lynn takes a few notes during the day and then Steve writes an initial draft which Lynn adds to, corrects, edits and censors. Sometimes Steve will slip a few uncensored comments in but invariably there is a price to be paid. 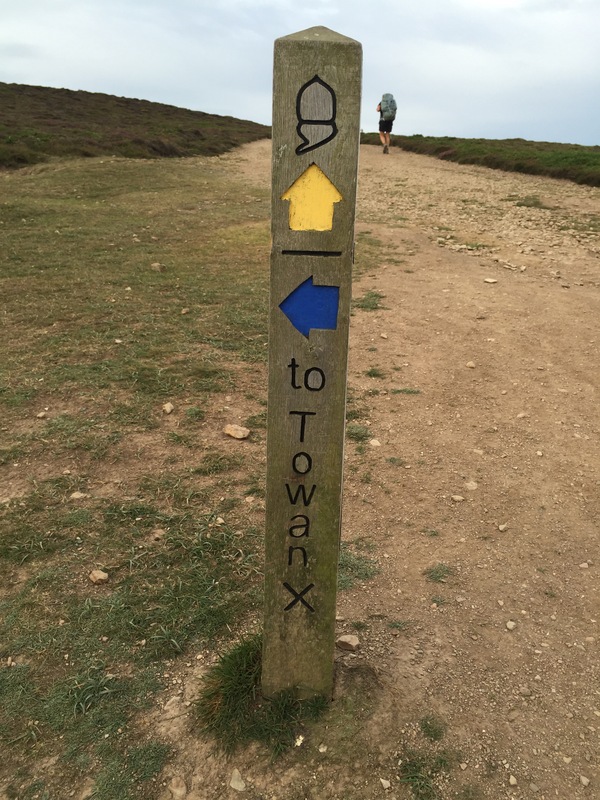 The walk has not been about the actual physical walking or even about the logistics of the exercise. What has made the experience truly life affirming has been the places we have passed through but above all else the wonderful people we have met along the way. To all of them and to all of you reading and responding to the blog a big thank you. 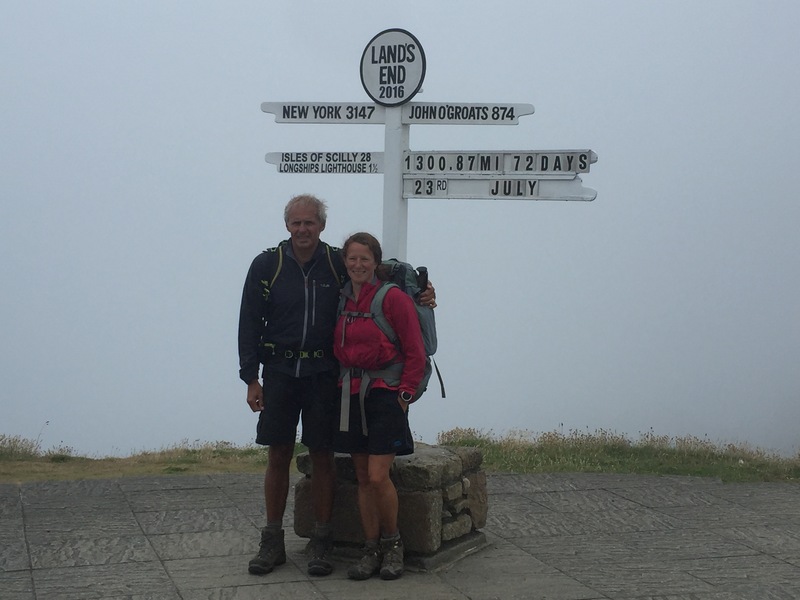 This bit is from Steve – Lynn had always dreamt of walking from John O’Groats to Lands End and it has been her resolve and determination that has seen us successfully complete the challenge and to have enjoyed it so much. It has simply been my good fortune to have met and married such a remarkable women. It is therefore only proper and customary that the final word should belong to her. 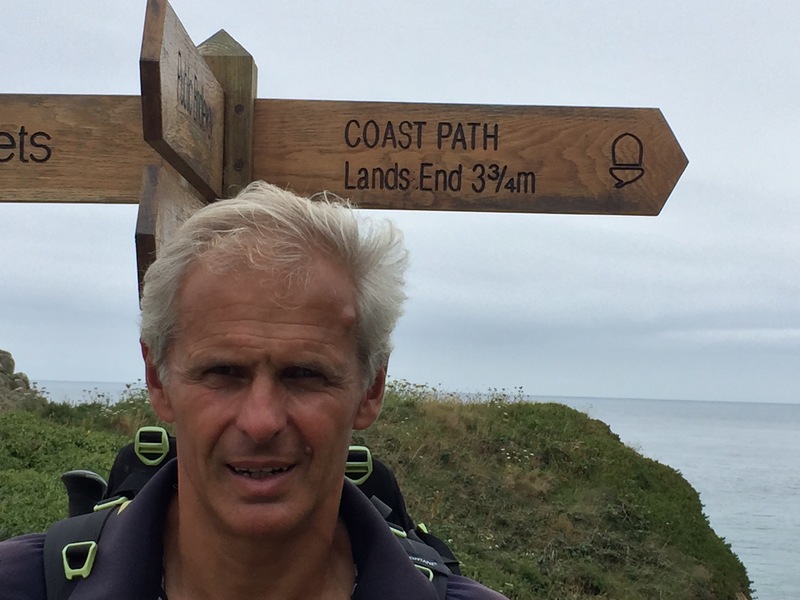 From Lynn – although we both decided on the broad route we would take for the walk, I would like to thank Steve for spending hours on the detailed planning. There were only a couple occasions where I wish I had been more involved (30+ mile days), but it was a huge task so l quickly forgave him. I also thank him for tolerating the camping element of the trip which for me has added to the enjoyment due to my love of the great outdoors. How lucky to have someone one mad enough to share this wonderful experience with. 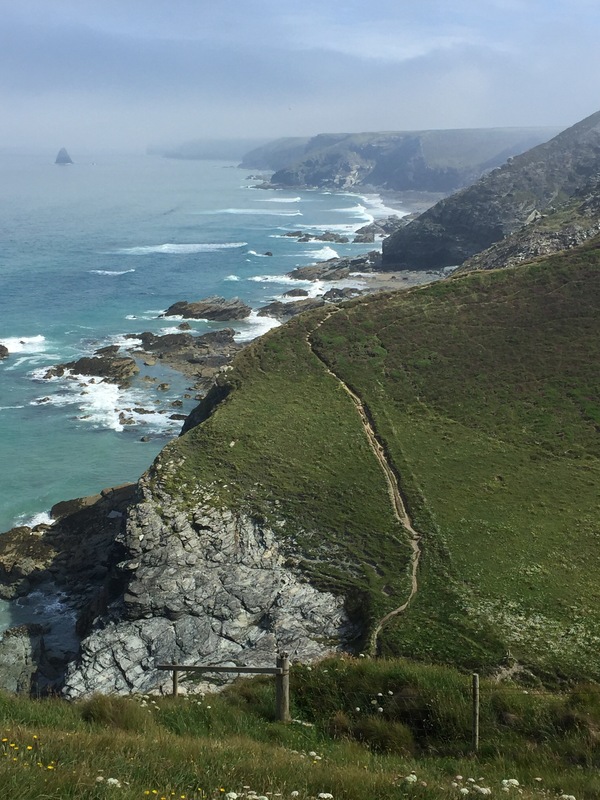 Today we crossed from the North coast to the South coast so our final walk in to Land’s End tomorrow is along the south coast, a route into Land’s End which we prefer. 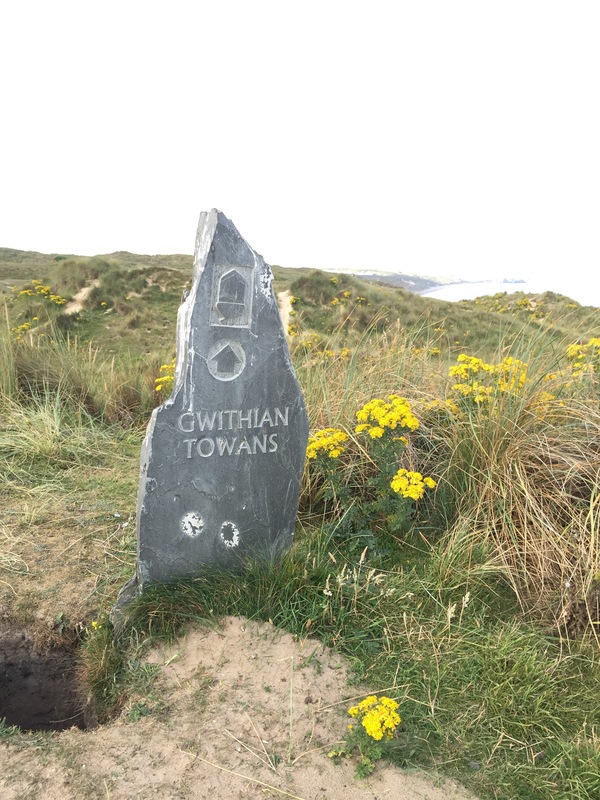 From Gwithian we walked through the dunes or Towans as they are called which collect all the sand blown across from St. Ives. 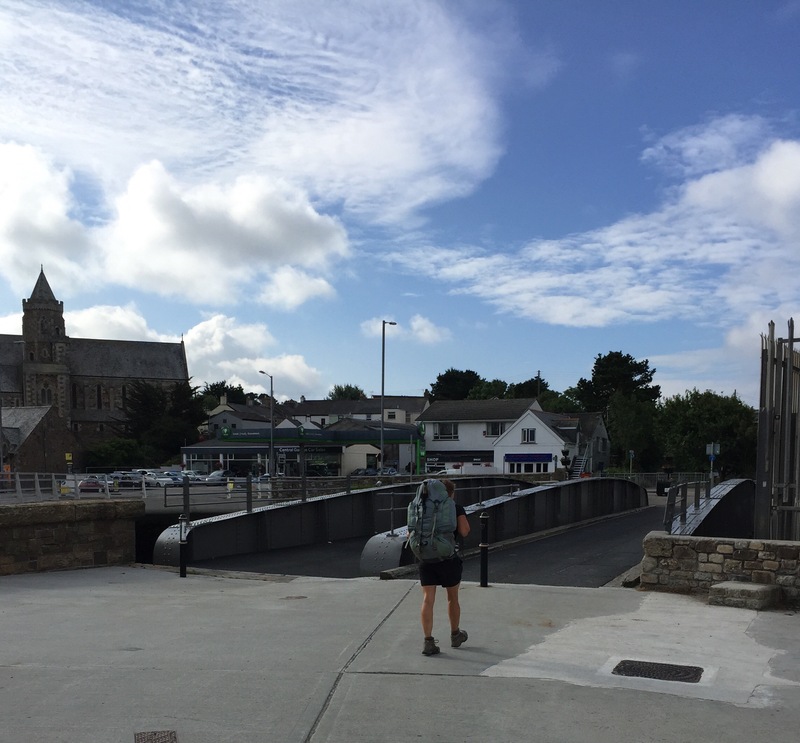 The route into Hayle is through the dock area which is gradually being redeveloped. Much of the activity is connected to the wave hub site offshore for testing methods of harnessing wave and tidal energy. 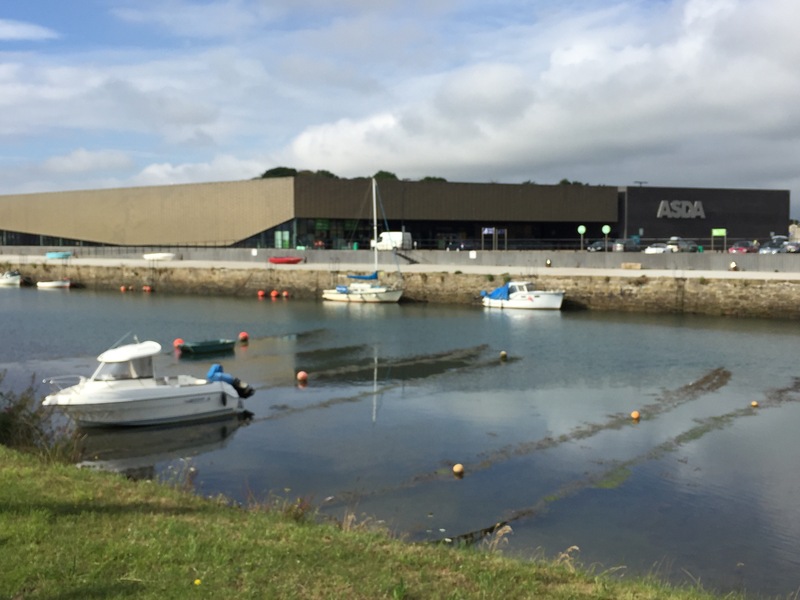 Hayle has a smart new Asda so tea and scones in the cafe beckoned. 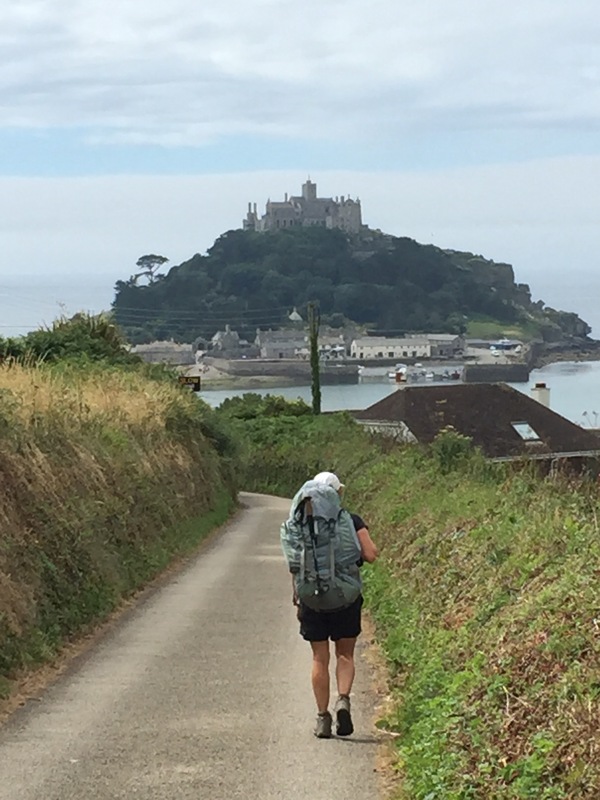 Following refreshment we left Hayle and the coastal footpath to cut inland and across to Marazion following lanes via St Erth. 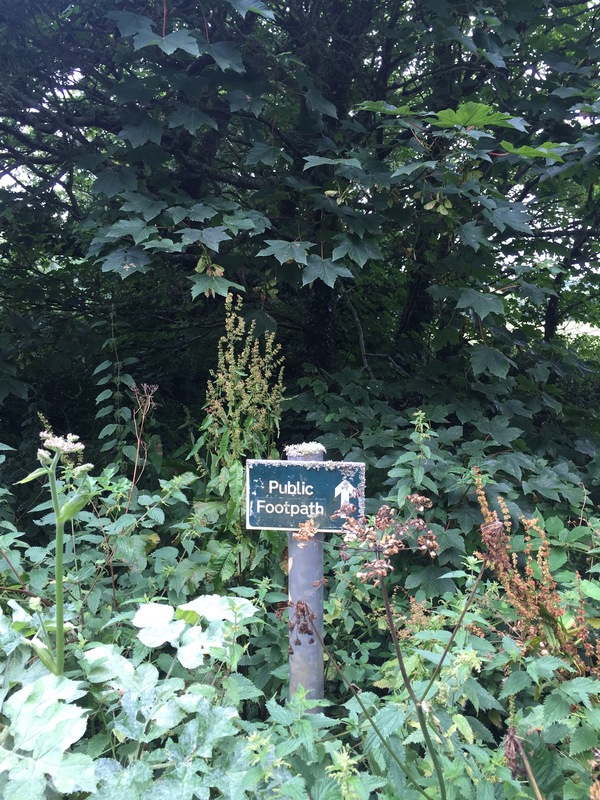 We avoided footpaths as we have found any paths away from the principal national trails to often be hopelessly overgrown at this time of year and a look at a couple of the paths we passed confirmed our decision to use the lanes. The route turned out to be the sustrans national cycle route #3. 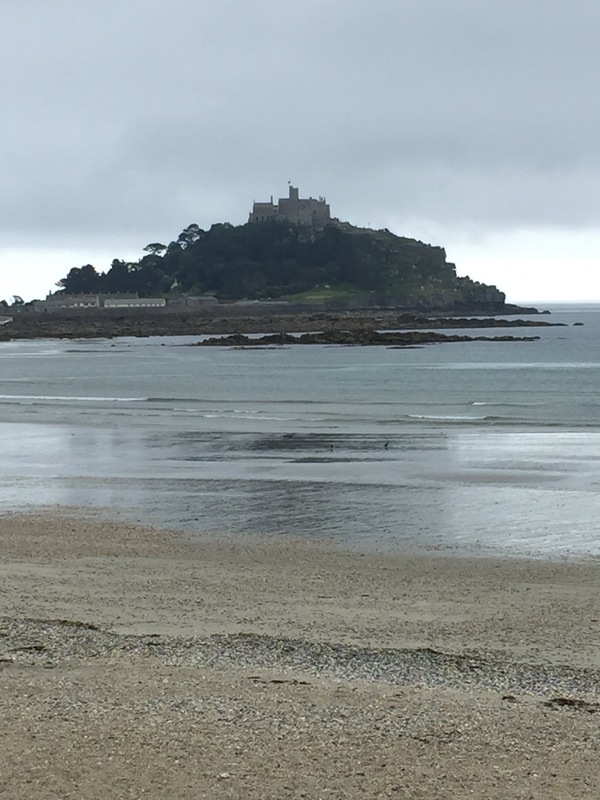 We dropped down into Marazion and had a good view of St. Michael’s Mount. 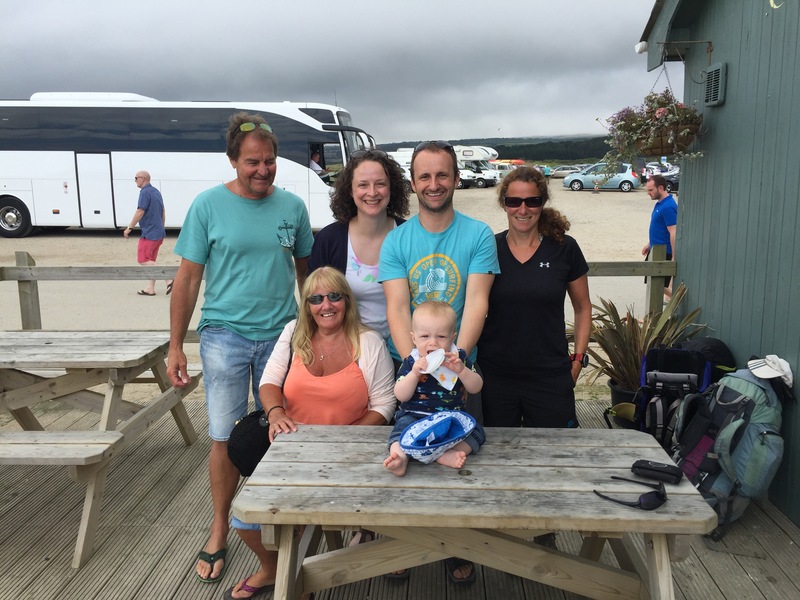 At Marazion we met up with Ryan, Geri and little Alexander, who has grown considerably since we last saw him over 10 weeks ago. 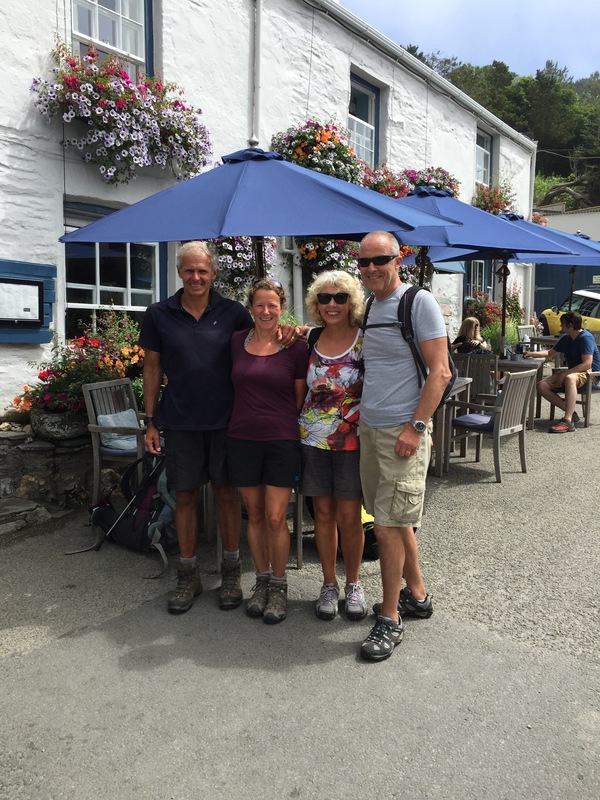 We also met John and Sandra, Cornwall locals, and Ryan’s uncle and aunt, a perfect excuse for a coffee stop and chat. 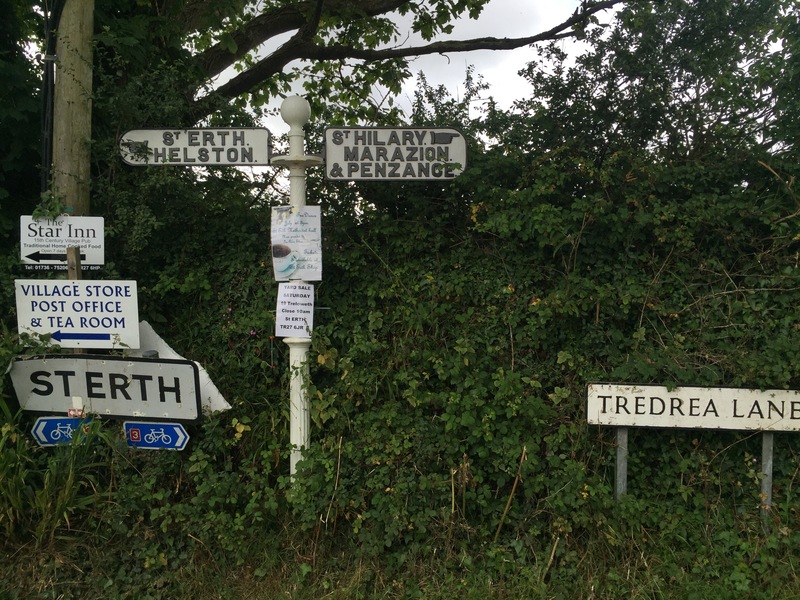 We all walked together towards Penzance and John’s local knowledge helped us to negotiate a footpath closure. 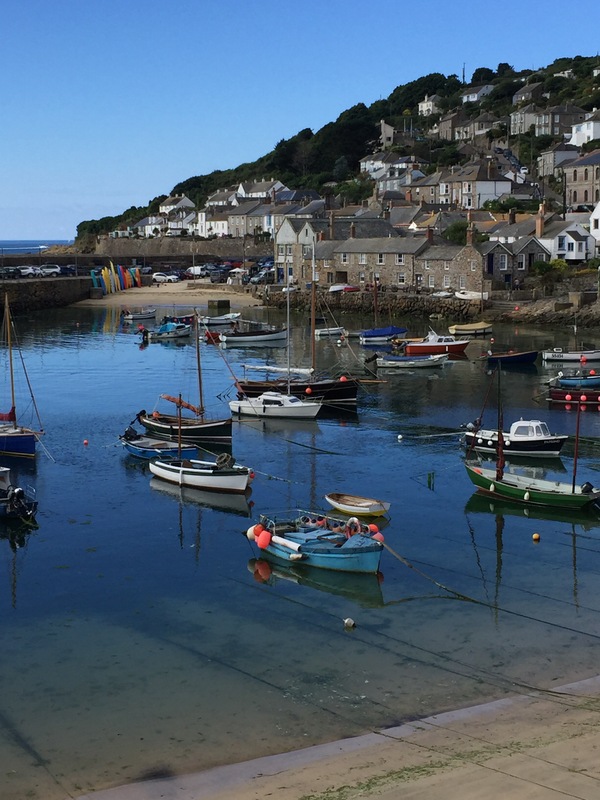 We left them and we carried on into Penzance where we predictably had lunch in the Wetherspoons before finding our B&B. We did some shopping for a t-shirt and shorts so we would have something fresh for our last couple of evenings and to wear on the train home. Oddly we both found dawdling round the shops exhausting. 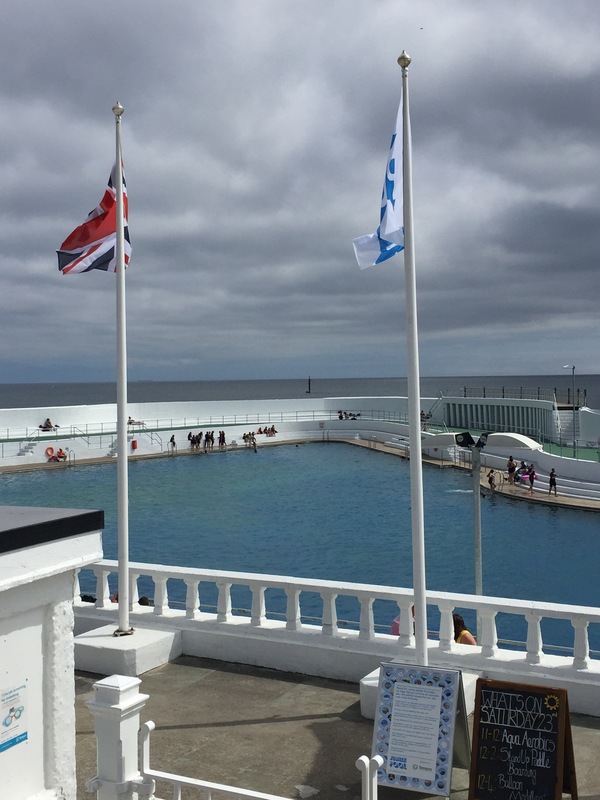 We found an ice cream and looked at the newly refurbished lido. Steve bought a t-shirt in Saltrock, which was sort of appropriate as the two South African brothers who founded the company first settled in Penzance before moving to Croyde in Devon and establishing the clothing business selling t-shirts to surfers. 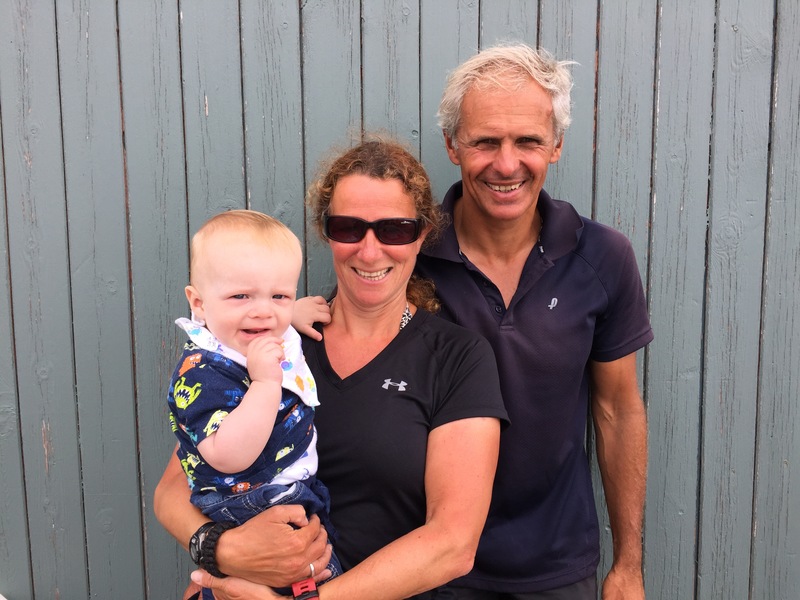 We met up with Ryan, Geri and Alexander for a meal in, you guessed it, Wetherspoons and wished them well for their first night of camping with Alexander. A busy day has helped us not to dwell on tomorrow, our final day. Thank you to everyone who has posted messages on the blog wishing us well for tomorrow – your comments are greatly appreciated. 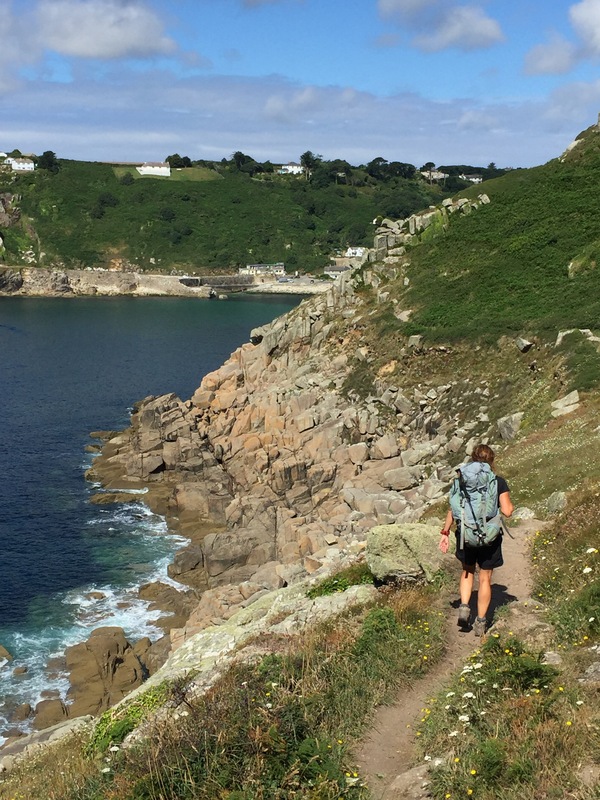 The whole ‘ blog thing’ has added an extra, and very enjoyable, dimension to the walk and without your comments it would not have been the same experience at all – thanks again. The weather forecast for our final day looks very good and today we had fine dry weather. So, all is set for the final day of ‘Lynn and Steve’s big adventure’ – bring it on! 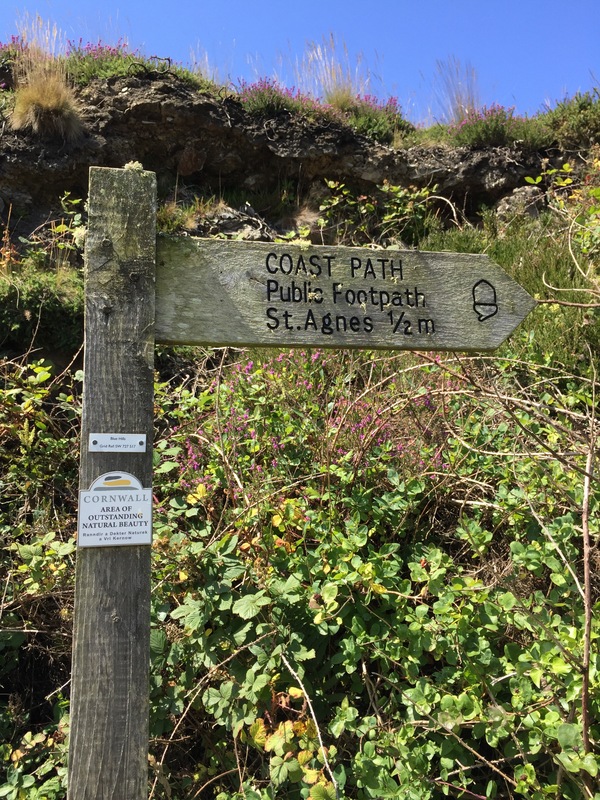 This section was all on the coastal footpath and is mostly a cliff top walk with a few switchbacks at well placed intervals. 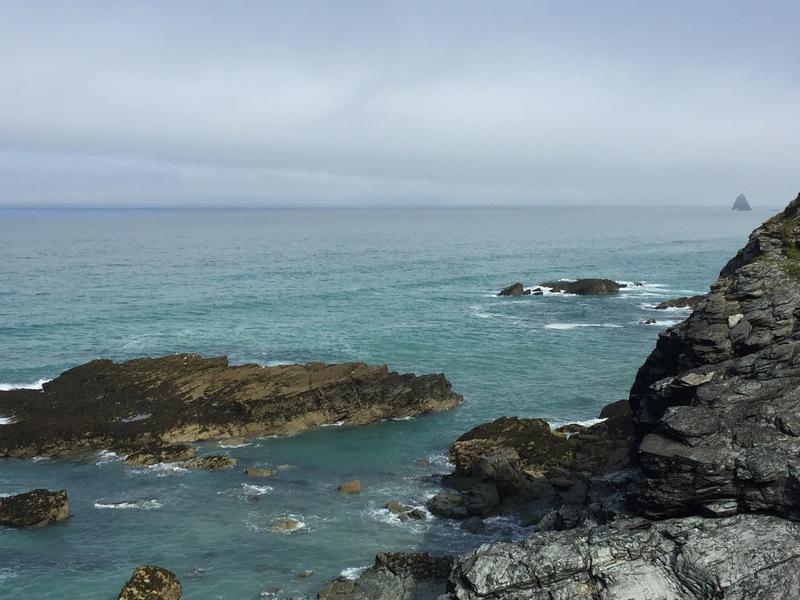 In order they went – Chapel Porth, Porthtowan and Portreath until we reached Godrevy point and the lighthouse. 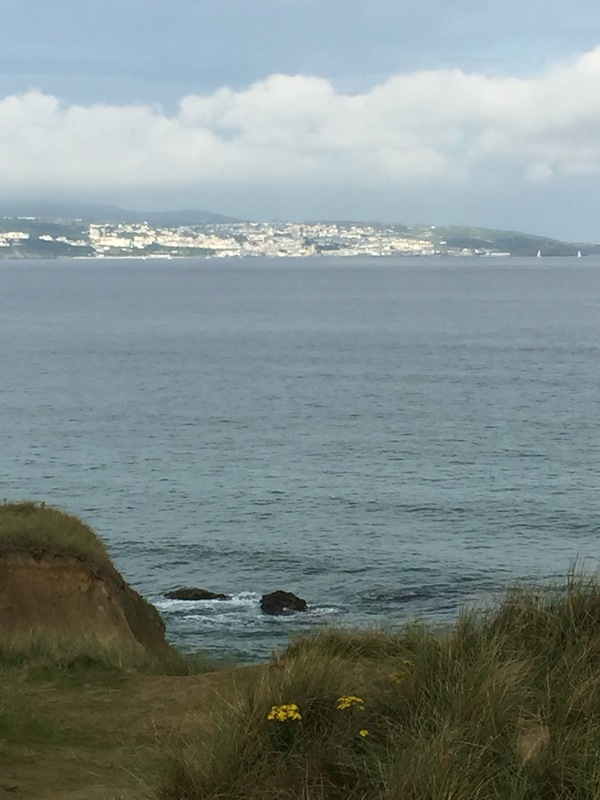 Customary tea and cake stops were endured at Portreath and Godrevy interspersed by a takeaway pasty lunch. The cafe at Hell’s Mouth was full as people took shelter from the drizzle, so we could not quite make it a triple tea stop day. 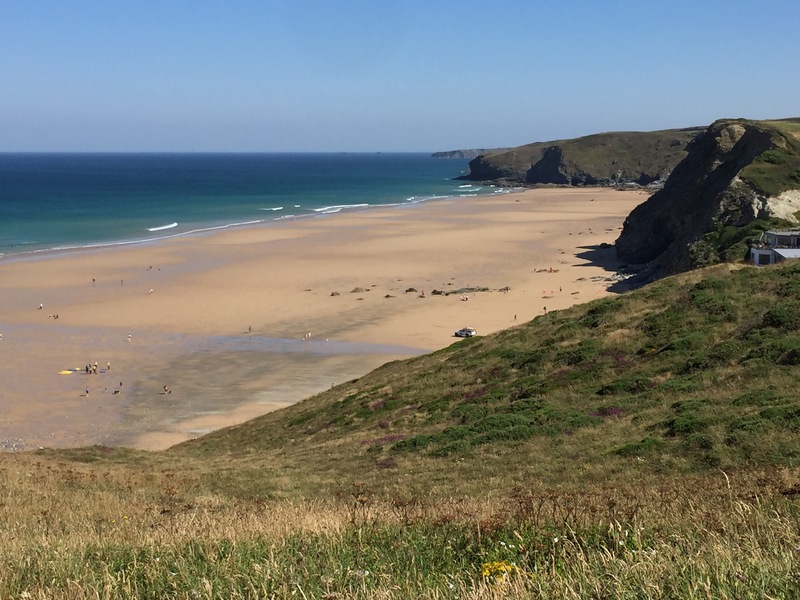 Porthtowan and Portreath both have good beaches and each have a mix of smart holiday rental properties, second homes, local residencies and various amenities but we always leave them thinking they could do with a good smarten up compared to other spots along the North Cornish coast. 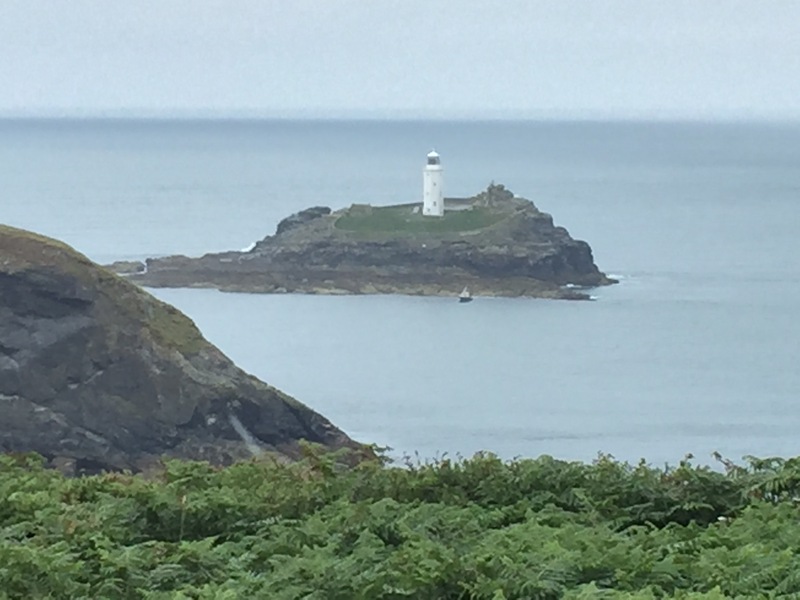 Highlight of the day, ignoring the homemade chocolate brownie from Godrevy beach cafe, was watching a family of seals by the lighthouse. They were the first seals we had seen since the east coast of Scotland and this group included pups still with their lighter coloured skins. 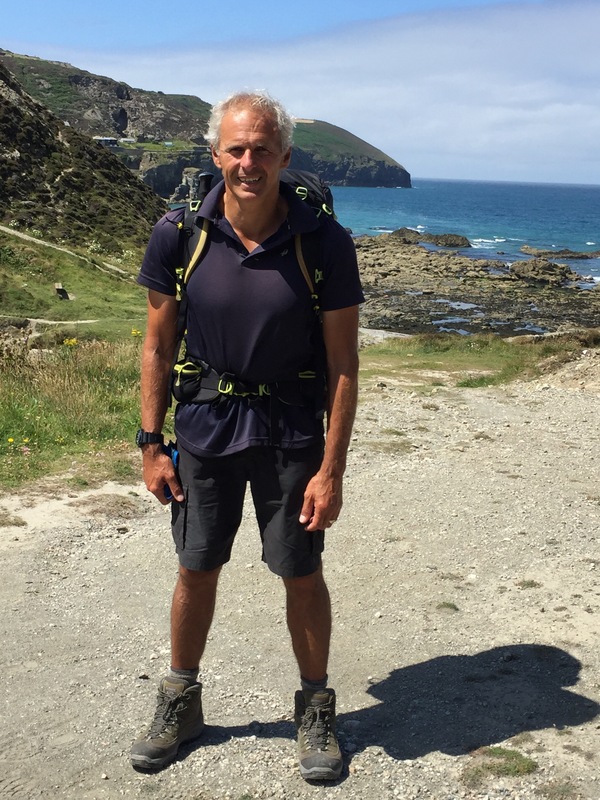 Steve wears ‘Sealskinz’ socks when the weather is wet but would wish to point out that no seals were harmed in order to make them – all the seals died of natural causes. 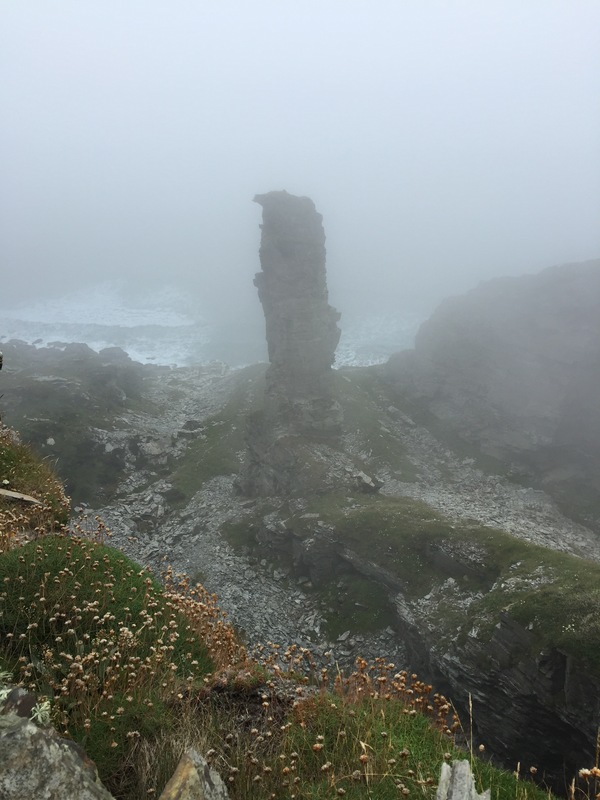 The day was characterised by on/off drizzle and light rain which gradually gave way to sunny spells of increasing length. The beach at Godrevy was busy with surfers and body boarders who were getting a reasonable wave. 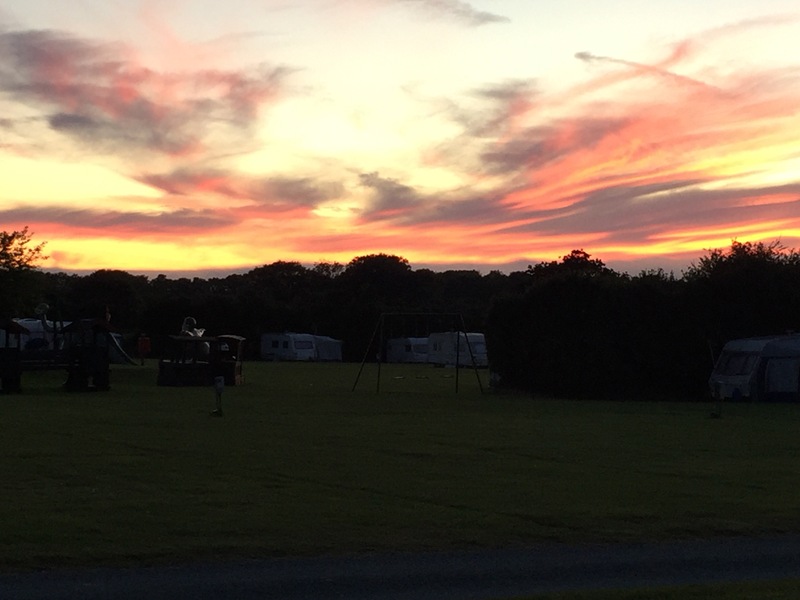 We have used the campsite at Churchtown Farm regularly over the years and each time we see improvements and it has got progressively busier. 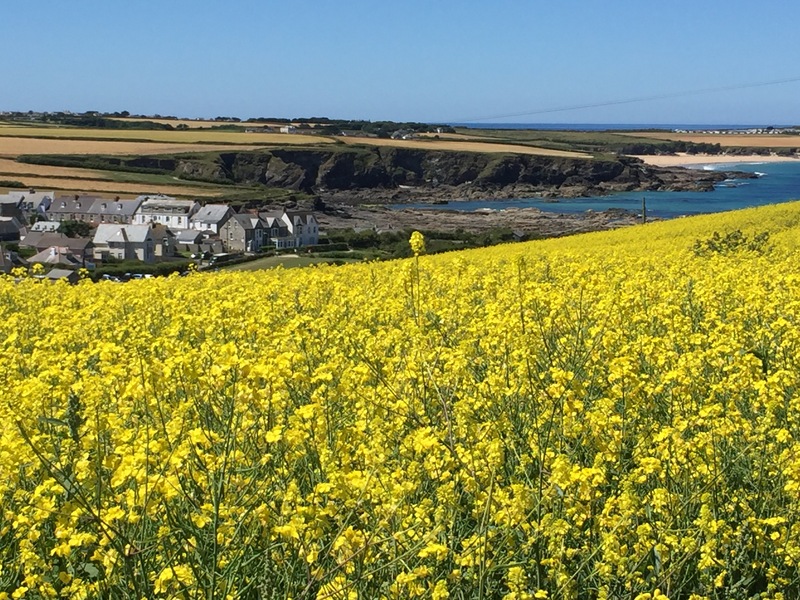 ‘Staycations’ and in particular camping holidays seem to be popular again and this site, in common with many others we have stayed at over the last 10 weeks is fully booked during the English school holiday period. This issue informed our planning for the walk and hence our original intention to finish on the last day of term (Friday) but we will now be finishing on Saturday. Tonight is our final night under canvas (well rip stop nylon) before a B&B in Penzance for a couple of nights before the train home on Sunday. 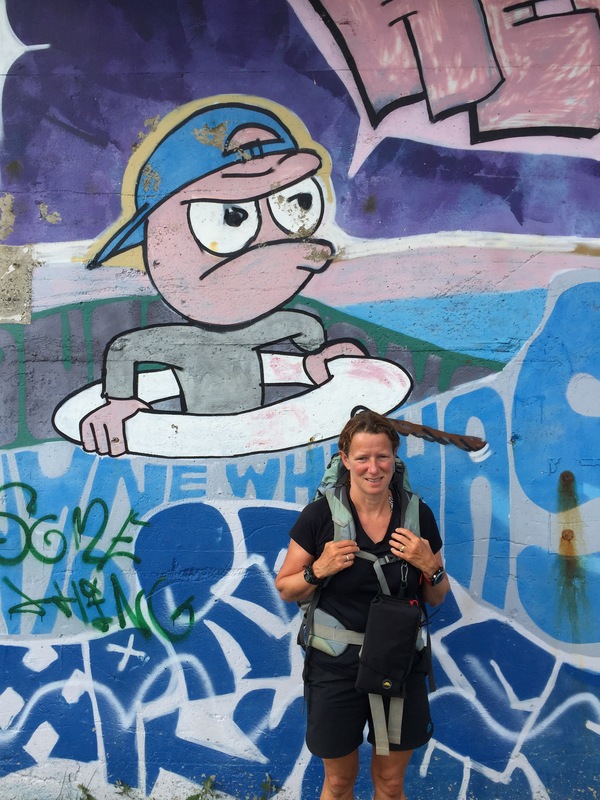 These final few days are not challenging as far as the walking distances and terrain are concerned but emotionally they are proving a little odd. On the one hand we want to celebrate and enjoy the achievement of completing the walk but on the other hand we are both feeling sad that this fantastic adventure seems to be drawing all too quickly to a close. We still have two days of walking to go. Saturday could prove to be a ‘difficult’ day. But enough of this emotional navel gazing drivel – the mobile pizza van complete with wood burning oven, rounded off our day of healthy eating by providing a 12 inch meat feast pizza for tea – excellent. 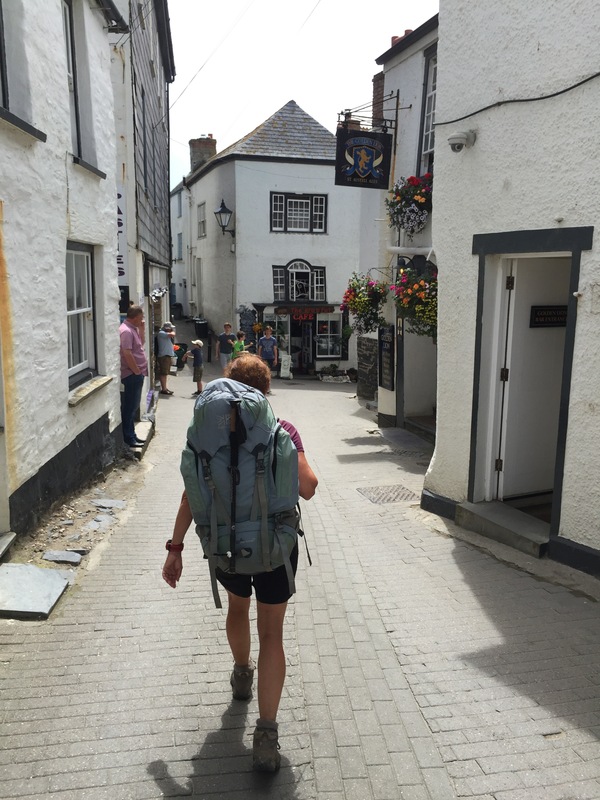 We left Crantock and climbed over to Holywell and passed St Piran’s pub to rejoin the coast path. Fortunately the pub is doing better than his Church and Oratory the remains of which are buried in Perran Sand’s dunes. 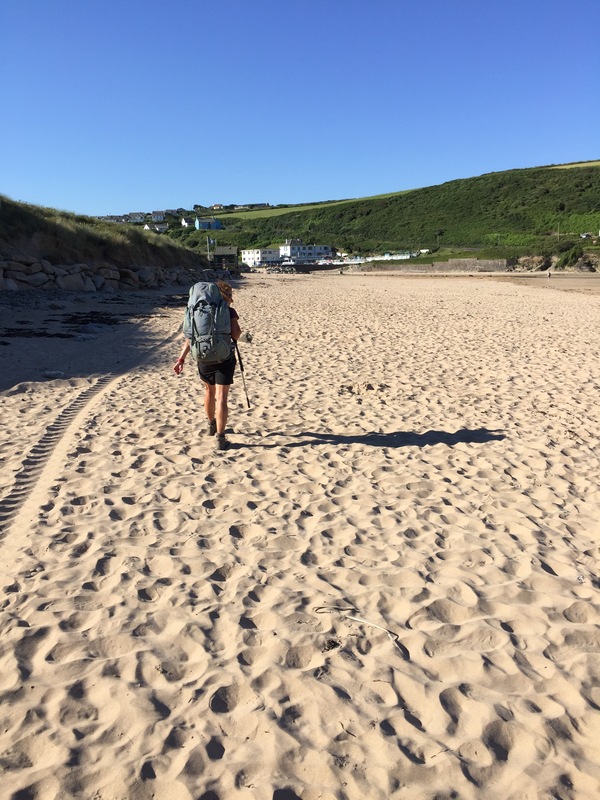 We walked around the headland past Penhale Camp and dropped down to walk along the 3 miles of Perran Sands into Perranporth. 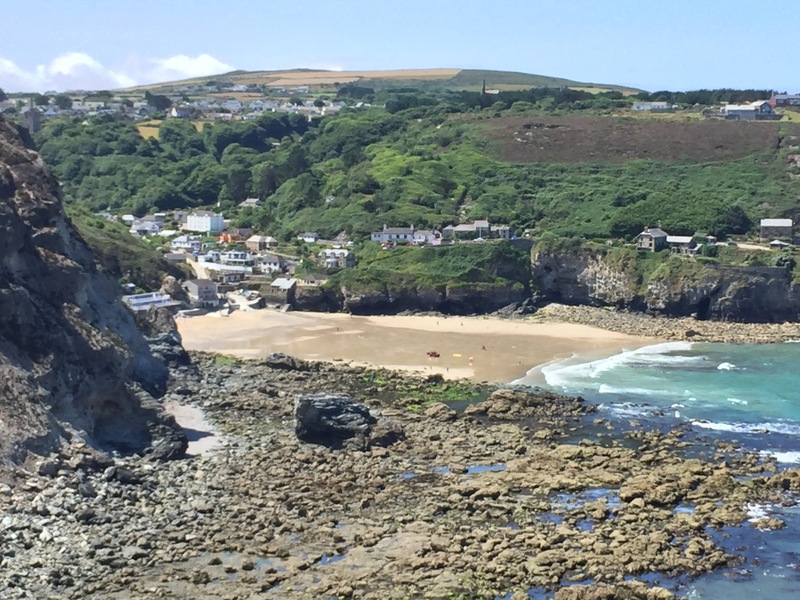 Perranporth beach brought back memories of pain and suffering. 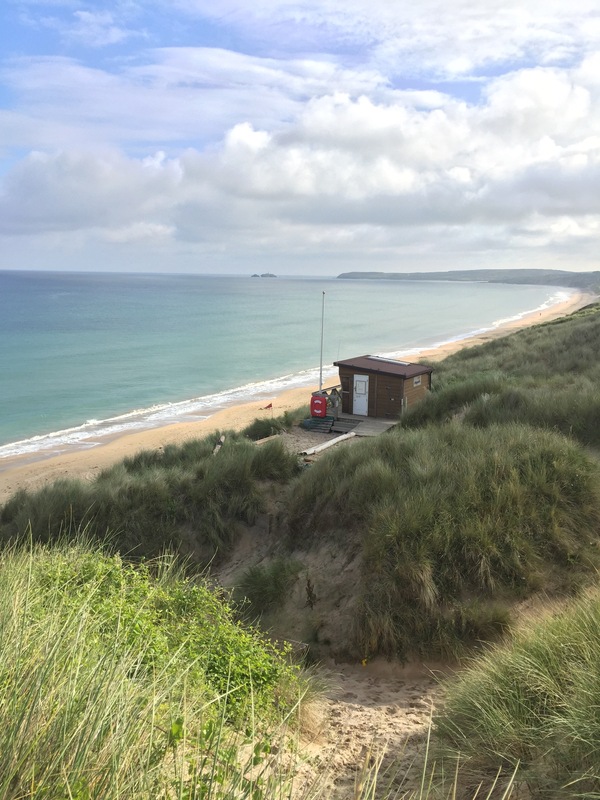 The Devon and Cornwall Police Cross Country championships were often held at Perranporth and the route invariably included the length of the beach and back over the dunes twice round. 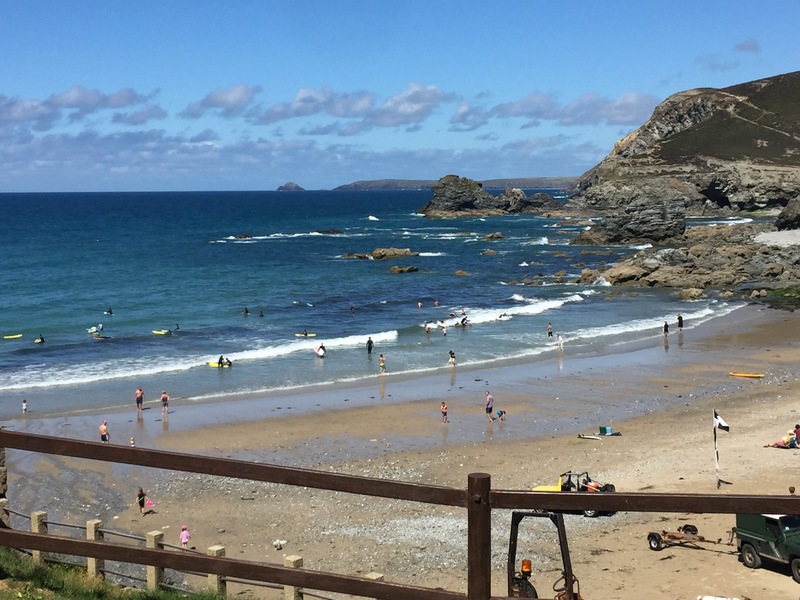 There is also the annual Perranporth surf triathlon. One year the event tried to kill all the participants which included Steve and Terry W. The sea state was so bad that in hindsight the swim section should probably have been dropped. As it was the event went ahead and most competitors abandoned the swim or had to be pulled from the water. Even the surf lifeguards were being thrown from their jet skis only to watch helplessly as the jets got taken down the beach by the surf. It was like being in a washing machine and became something of survival exercise. 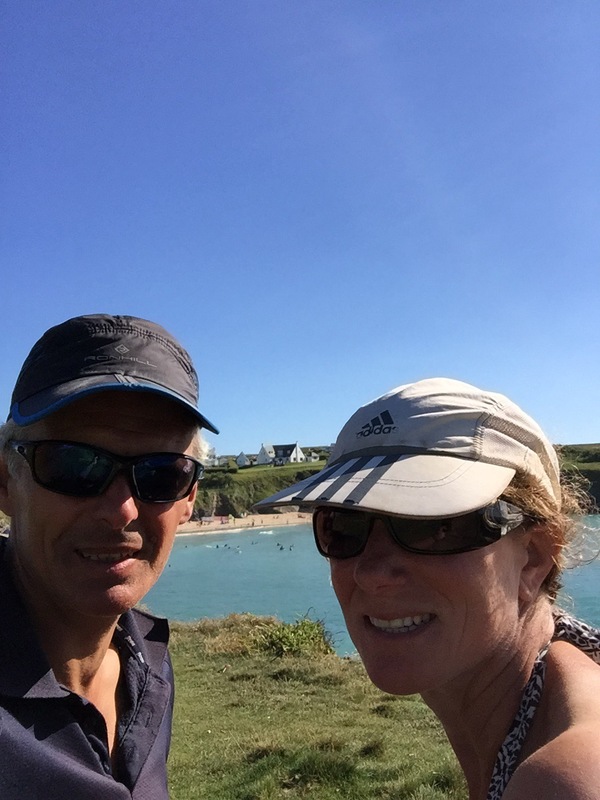 Lynn and Terry’s wife, Karen, had been on the beach witnessing the carnage and when Terry and Steve eventually emerged from the surf and were running past them up the beach to transition, tears of relief could be seen on their eyes. 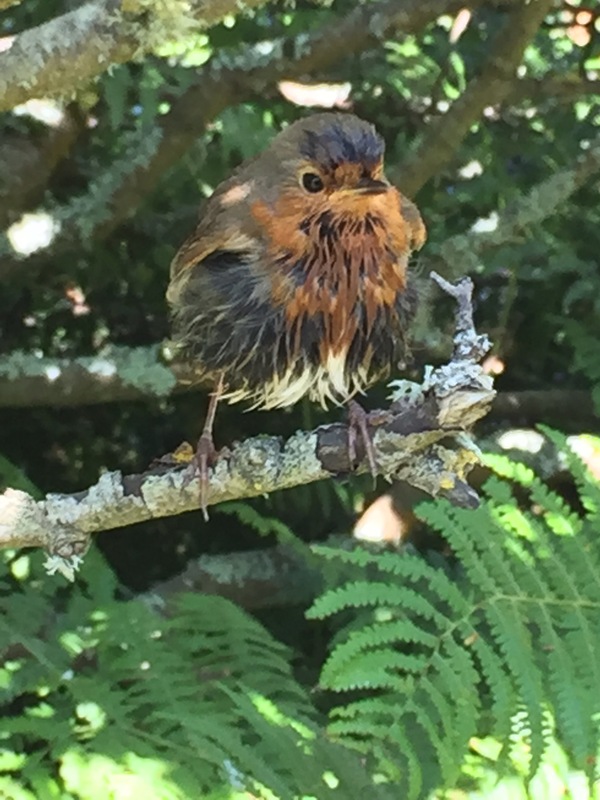 Well that is what Lynn claims, Steve suspects they were a different kind of tears as Lynn had probably been adding up the life insurance policies. Barry F videoed the event and it makes quite scary viewing. Fortunately the following year the surf was benign. 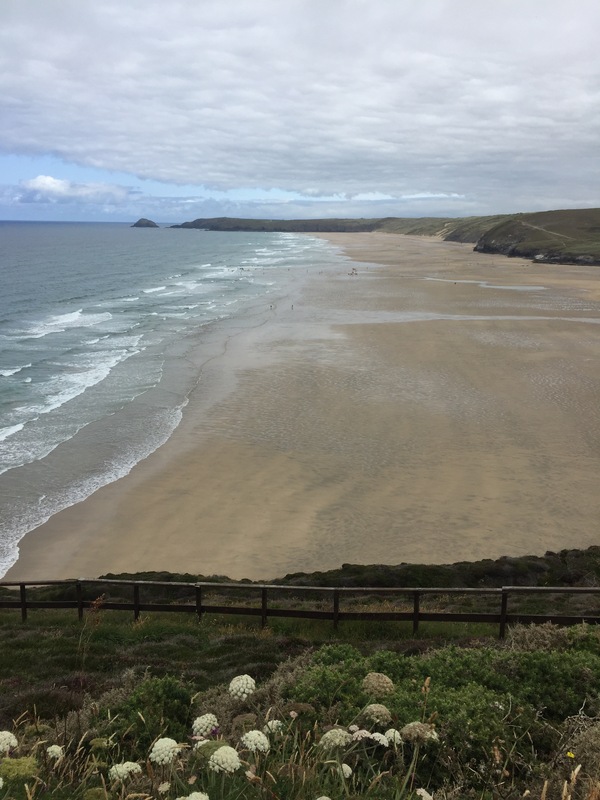 Perranporth has been a surfing spot since the 1920’s and appropriately the first surf boards used there were coffin lids. Perranporth like so many spots along the north Devon and Cornwall coast is full of surfer dudes and girls with their VW vans. Lynn would like to point out that whilst Steve has a VW van he is no surfer dude. His longboard is the size of a small aircraft carrier and if the waves are over waist height he is likely to be found sat in the van listening to Radio 2 and reading the newspaper. At Perranporth we left the beach by the surf Lifesaving club and the Waterjng Hole pub and went to visit the Coop for supplies. It is worth mentioning the Coop stores. All along our route in the smaller villages and towns the Coops have been the only grocery stores. The quality of their own brands has been very good and they have stocked everything we have needed including usually having an ATM. They have been a godsend and the store in Perranporth is typical of their commitment to smaller communities. They should be supported. It should come as no surprise that we stopped off at the ‘The Green Parrot’, a Wetherspoons (sorry Ryan) for an endless coffee, breakfast wrap and sneaky phone charge. Suitably refreshed we climbed out of Perranporth and over to St. Agnes (Trevaunance Cove) past the tin mine remains and into the lovely beach at Trevaunance Cove where we were determined to spend a few hours in the sunshine. 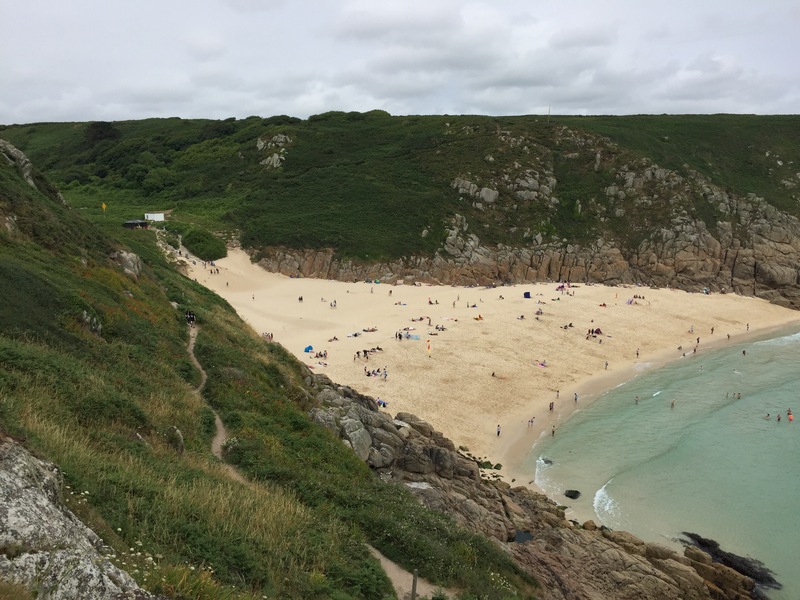 These beach stops in St Agnes have become a ritual for us when walking the SWCP. St Agnes is not a lucky town when it comes to construction. 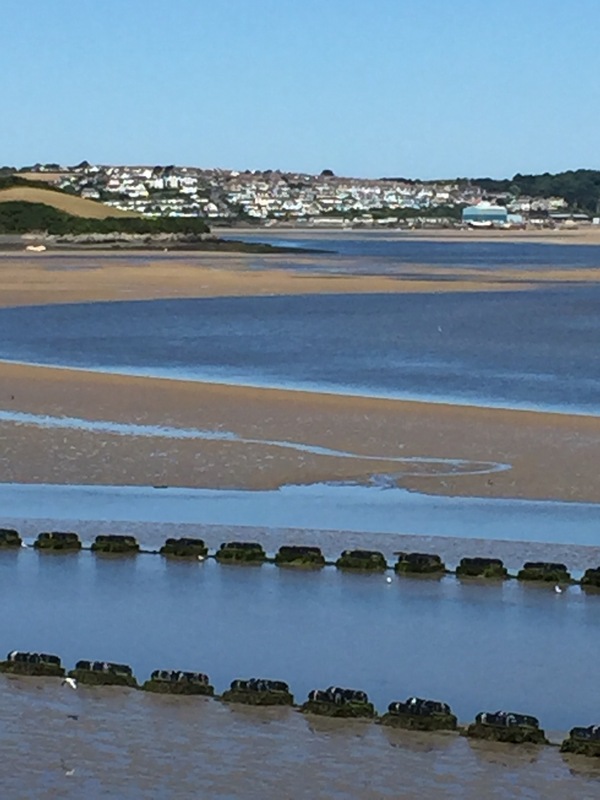 Five harbours have been built at the Cove. 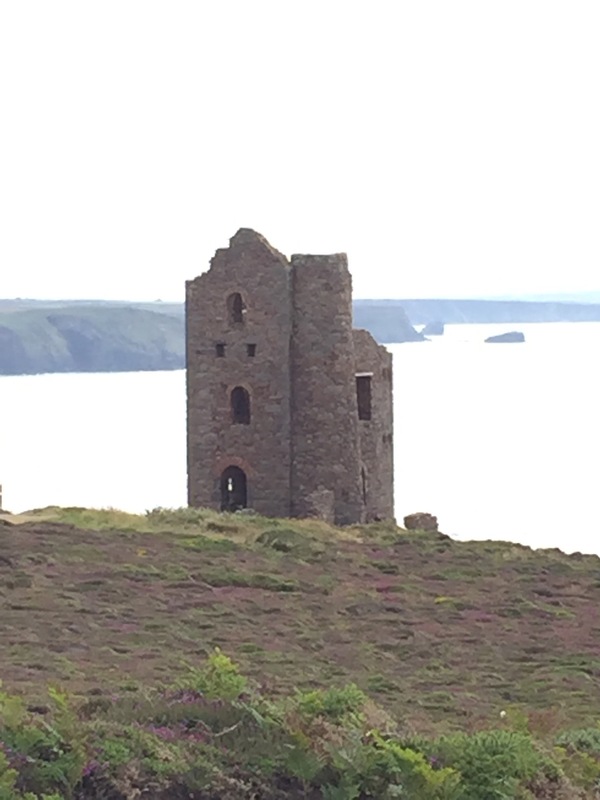 The first built 1632, not finished destroyed the same year by gales. 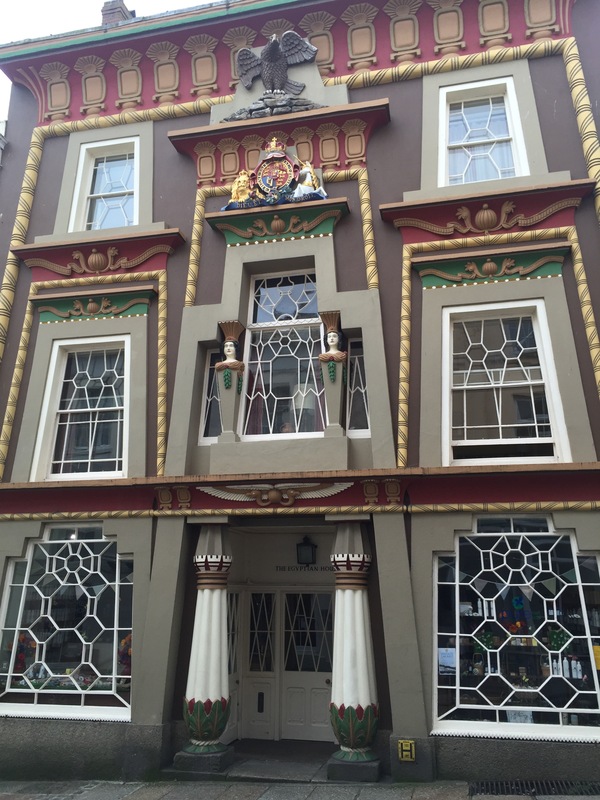 The second built 1684 got further than the first but destroyed by gales the same year. The third built 1699 to a Winstanley (Eddystone Lighthouse) design lasted until 1705. The fourth built 1709 destroyed 1730. 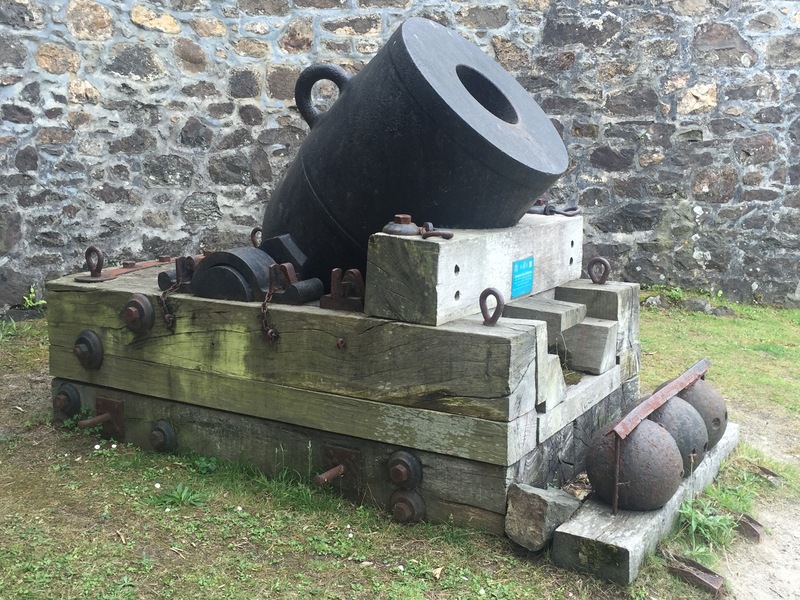 The fifth built 1793 lasted until 1915 when it too was destroyed by gales. 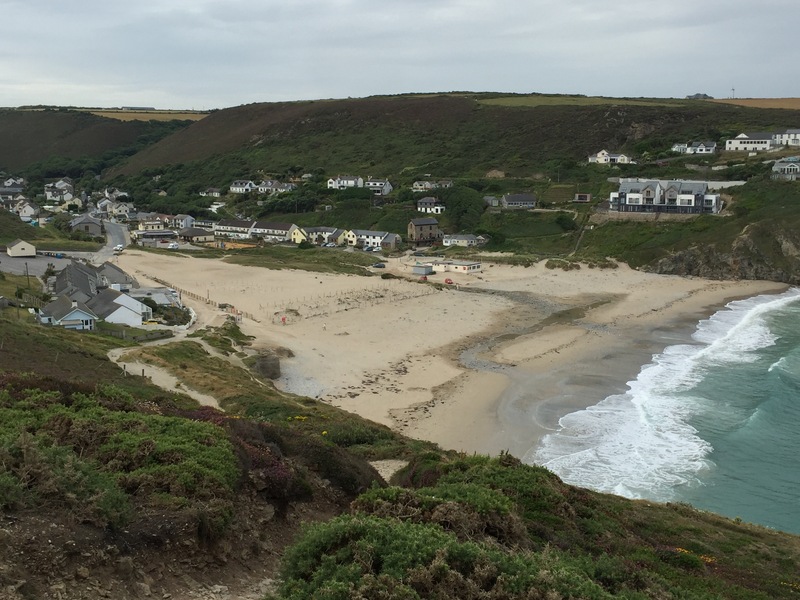 Today there is no harbour at St. Agnes but the beach is lovely. 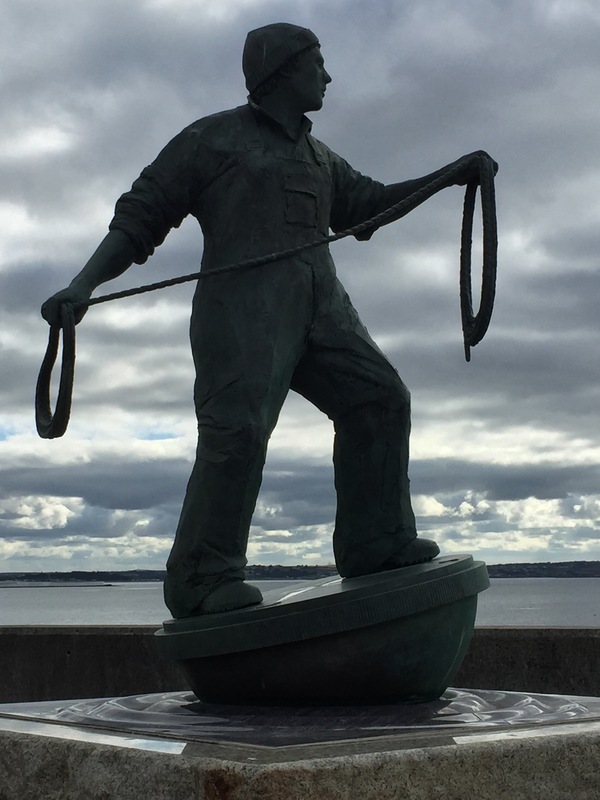 Four ships, schooners, were built in St. Agnes. 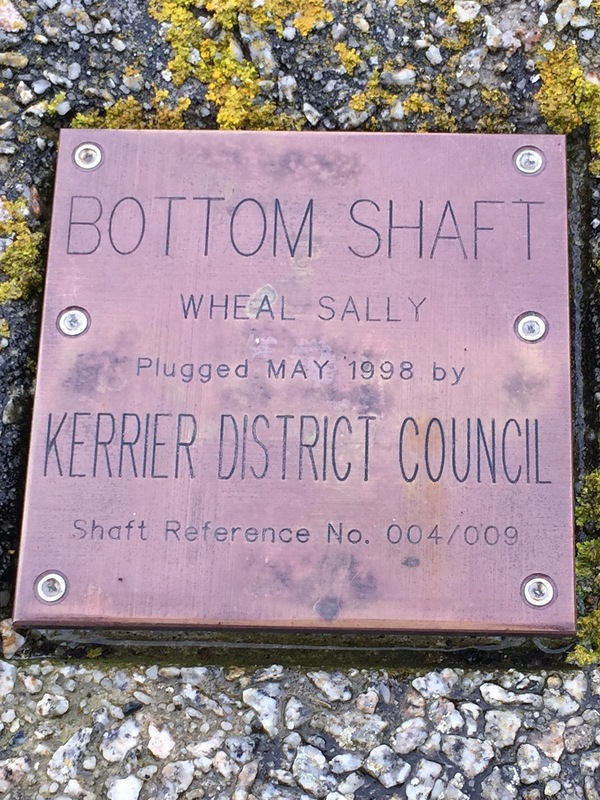 The first built 1873, 1906 stranded and lost. The second built 1874, wrecked 1901. The third built 1876, left Port Talbot in 1930 and was never seen again presumed ran aground and sunk. The fourth built 1877 ran aground in 1937 with a cargo of slate from Porthmadoc, managed to return to port where it was abandoned and left to decay. Do not build anything in St. Agnes. The pub overlooking the beach is fittingly called ‘Schooners’ and the cafe is called ‘Breakers’. 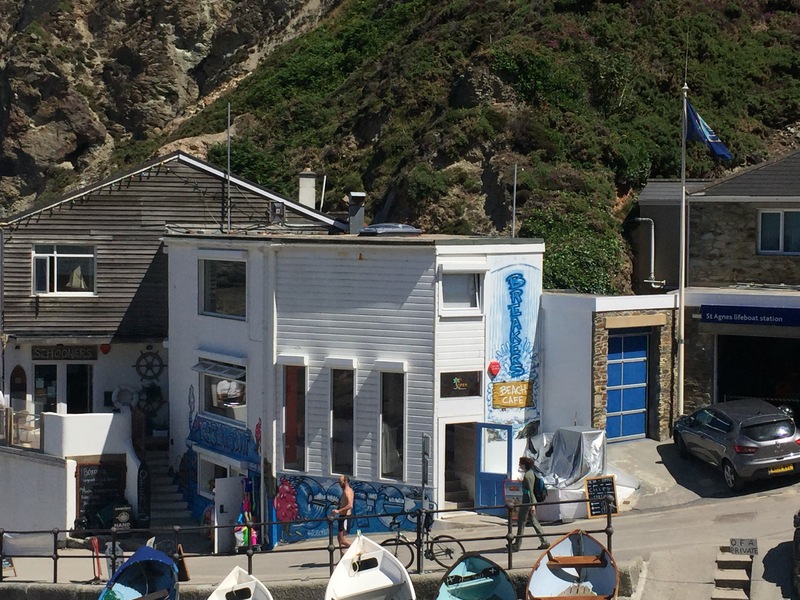 The lifeboat station is next door. 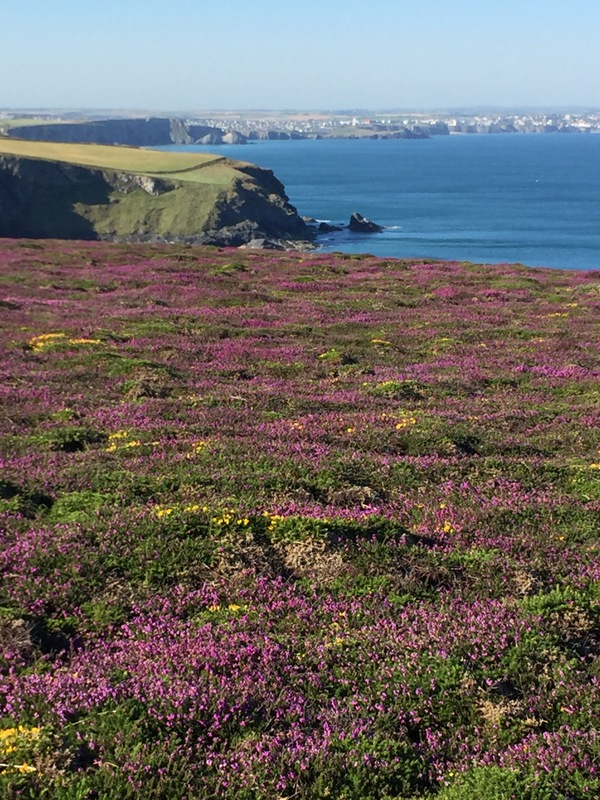 Poldark to be seen – and cut inland to the campsite at Barton Cottage Farm. A further spot of sun bathing in the lovely weather rounded off a good day. 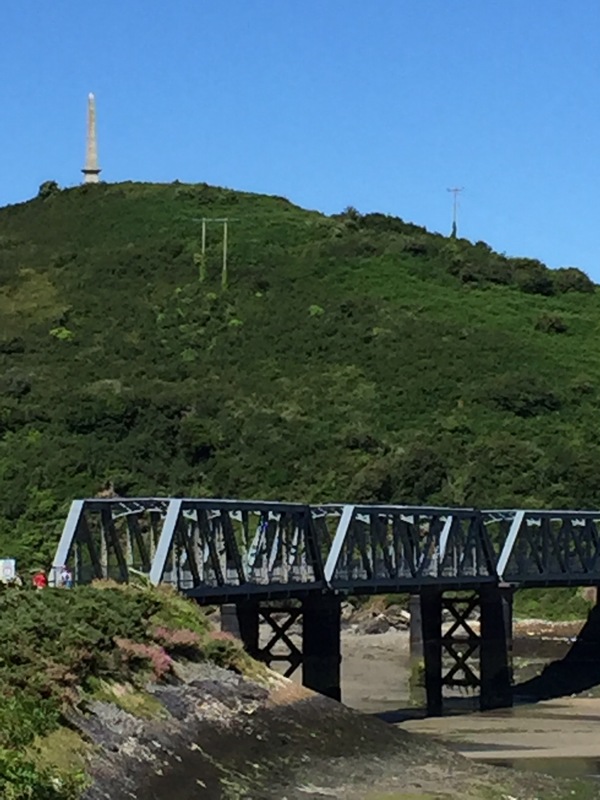 We got off to an early start to get the miles in before it got too warm and so we could use the footbridge to cross the Gannel Estuary between Newquay and Crantock before it gets covered by the tide. 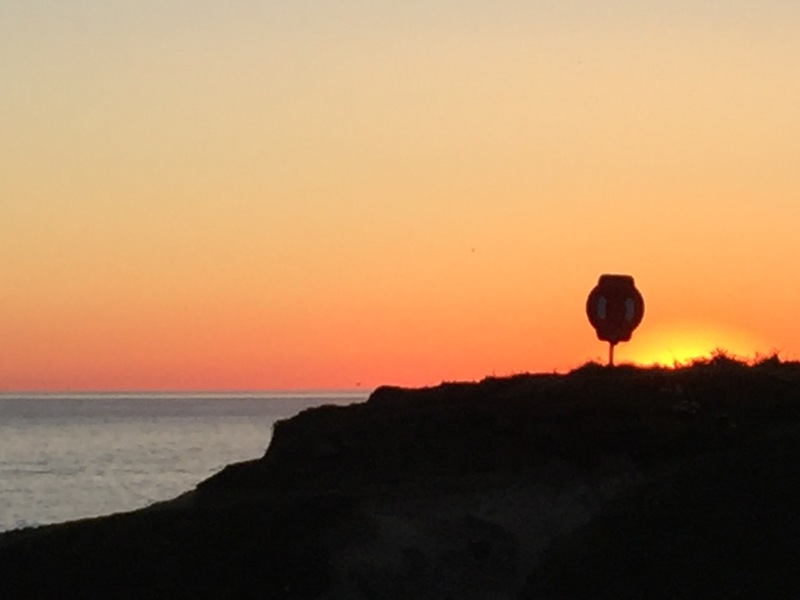 The going is much easier along this stretch of coast. 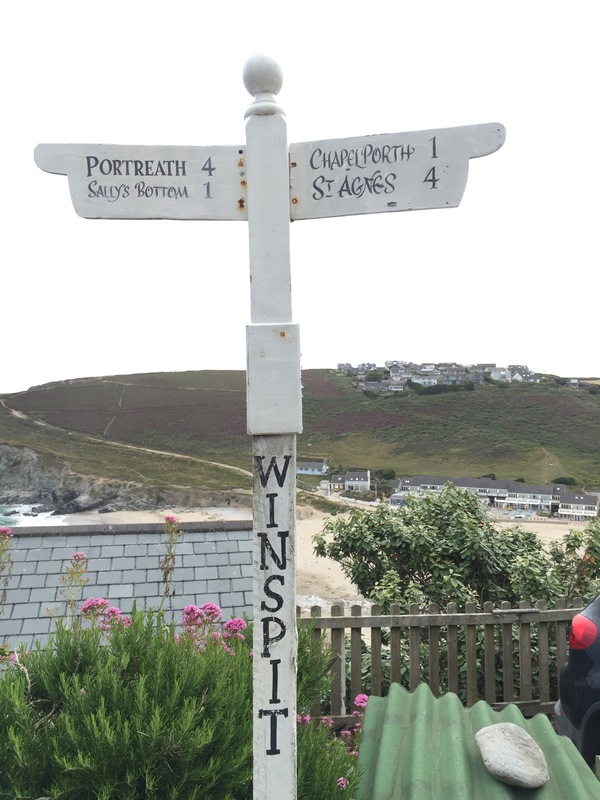 We passed through Porthcothan, Trenance and stopped for tea and a scone (freshly made to a ‘James Martin’ recipe by the proprietor John) at ‘Coasta Cafe’ in Mawgan Porth. They were delicious and light scones. 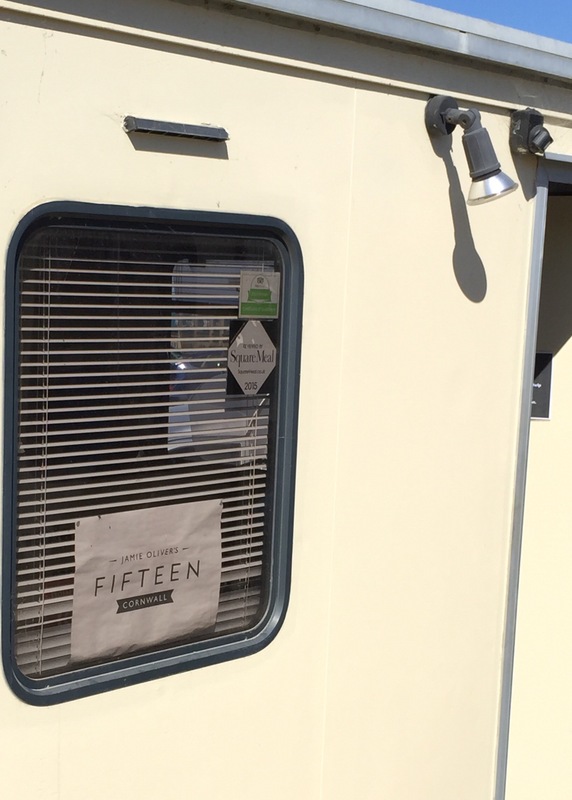 We carried on through Watergate Bay past the posh apartments and Jamie Oliver’s Fifteen Restaurant – although times must be hard for him as the restaurant appears to be in a few Portacabins, another brexit casualty. We were accompanied for most of the morning by a twin engined plane doing loops into and out of Newquay airport. It was very windy and the plane wobbled about a fair bit. We were glad we were not flying to the Scillies any time soon. Mary, we hope you make it out there on Friday, do not have a large breakfast. 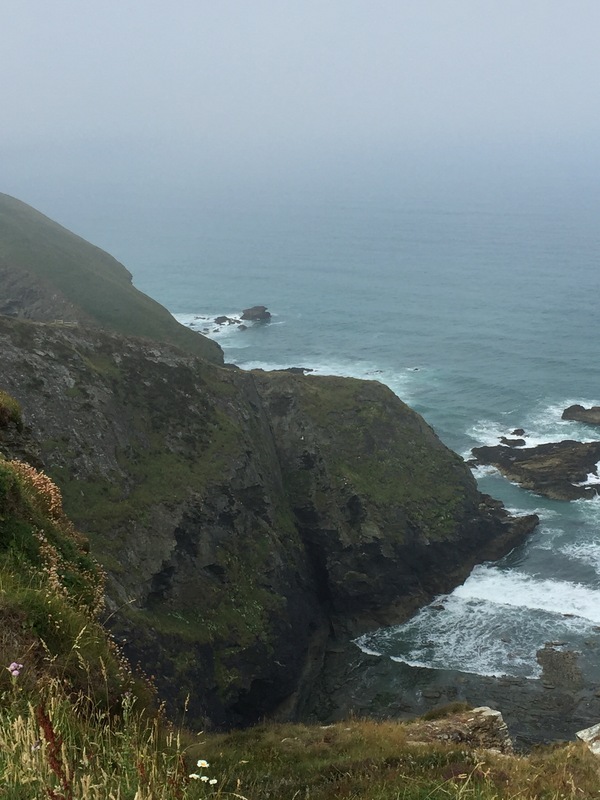 We reached Newquay, which is always an assault on the senses and took refuge in a St.Austell Brewery pub, the Great Western Hotel, so Ryan should be a little happier about that, and we had tea and cake (well Steve had cake). 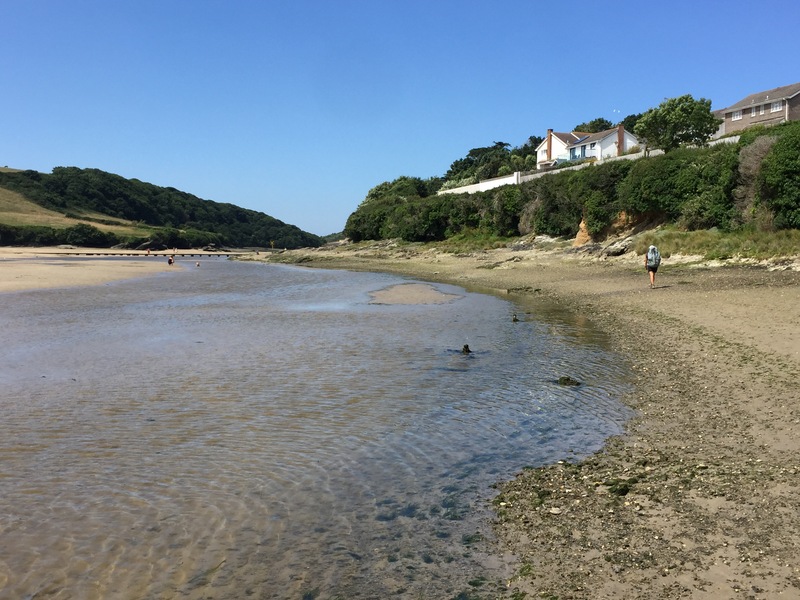 We reached the Gannel at low tide and crossed the footbridge to Crantock where we headed straight to the village shop for a lunch time pasty and then into the Cornishman pub for a cool pint. 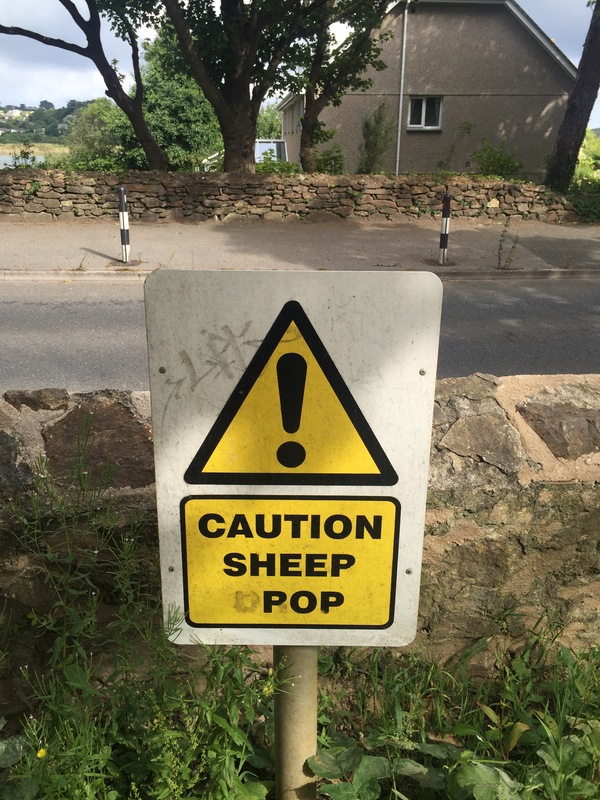 You may start to detect a pattern in the way we approach coastal footpath walking in Cornwall. One of the undoubted benefits of walking a few miles each day carrying a fairly heavy rucksack is that you can eat pretty much what you want without worrying about your waistline. An abundance of tea stops and pubs have to be negotiated en route and it would be rude to ignore their charms. 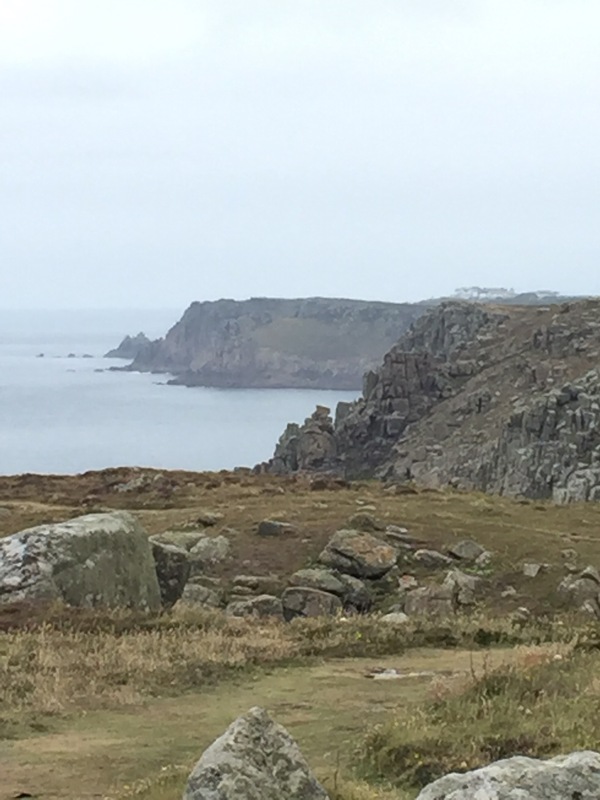 From Crantock it was a short walk to one of our regular coastal path campsites at Treago Farm. 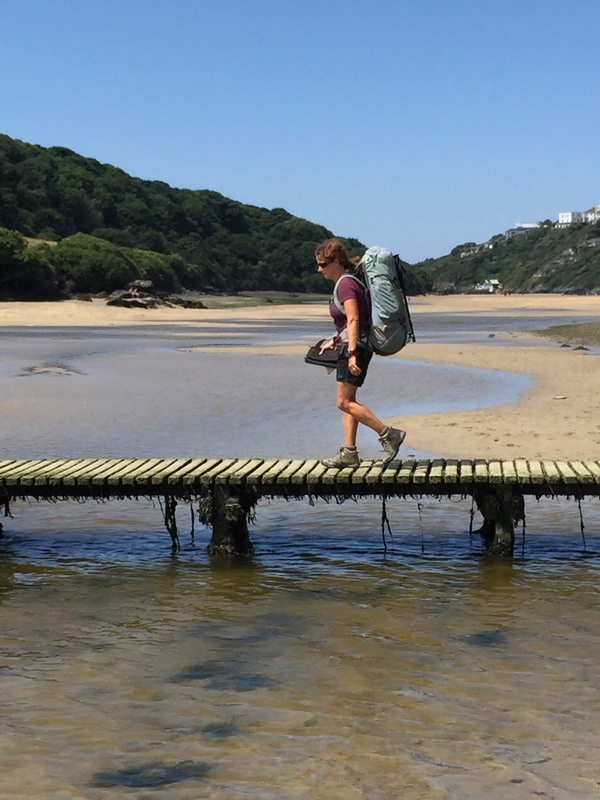 Having had a little lie in, we said goodbye to Sam and John and left Bodieve to get to Wadebridge as the shops opened to begin the quest for new boots for Steve. We got supplies from the Coop and Steve went to a shop he had found from an internet search. Bingo! 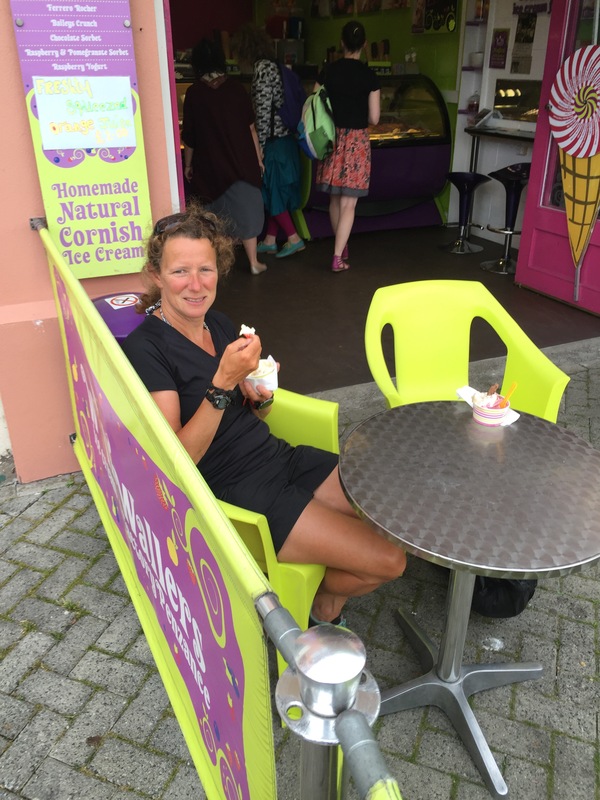 A big thank you to Drew at Countrywise Wadebridge – http://www.countrywisewadebridge.co.uk – a lovely shop, they had like for like replacement boots in the right size and they were in the sale, so Lynn was pleased. Drew could not have been more helpful.Steve walked out in identical new boots and Drew took on the task of hazardous waste disposal. 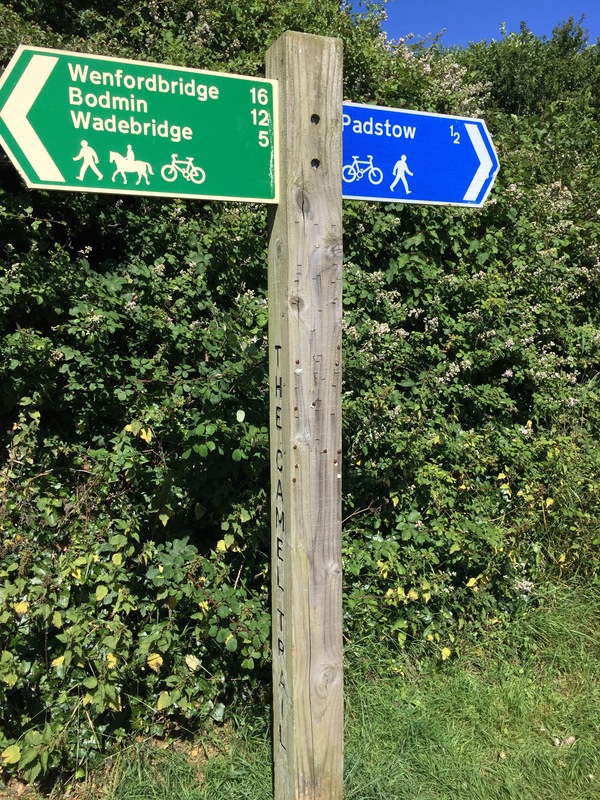 By ten past nine we were off and onto the Camel Trail our route to Padstow, another railway turned cycle route. 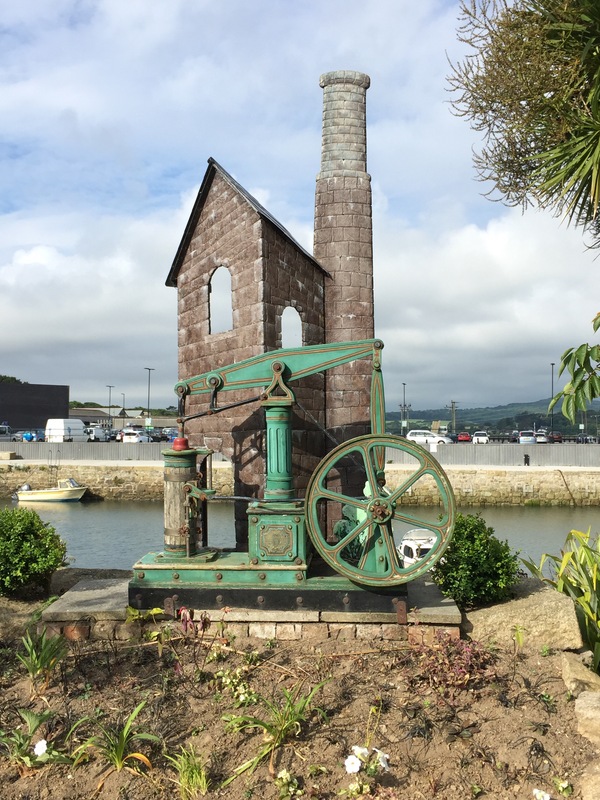 It runs from Bodmin to Padstow and is now Cornwall’s third largest visitor attraction. We reached Padstow, or Padstein as it is now called, which was busy, but we found a quiet cafe for a sausage roll and tea. 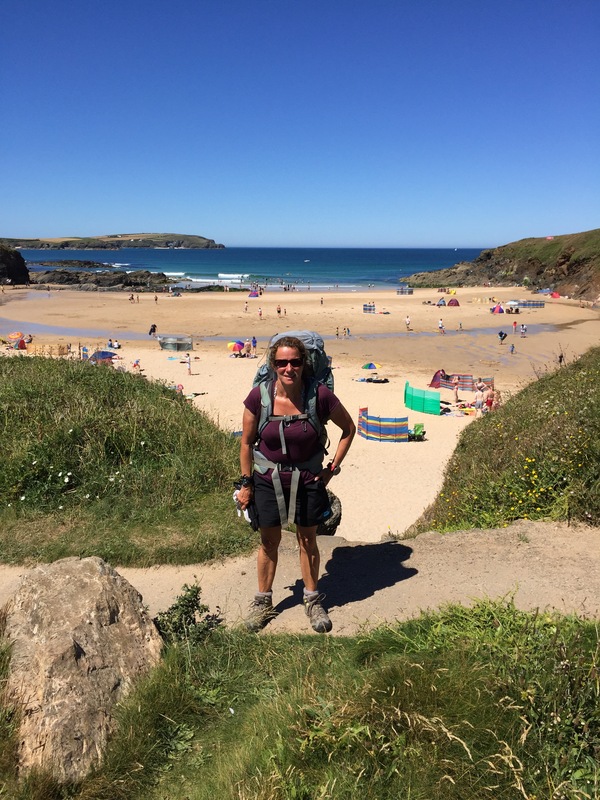 We then used lanes, coast path and footpath to reach Constantine Bay and on to Treyarnon. It was a hot sunny day and we were glad that for us, a shorter one. We spent the afternoon lounging by the tent, on the beach and swimming in the sea. 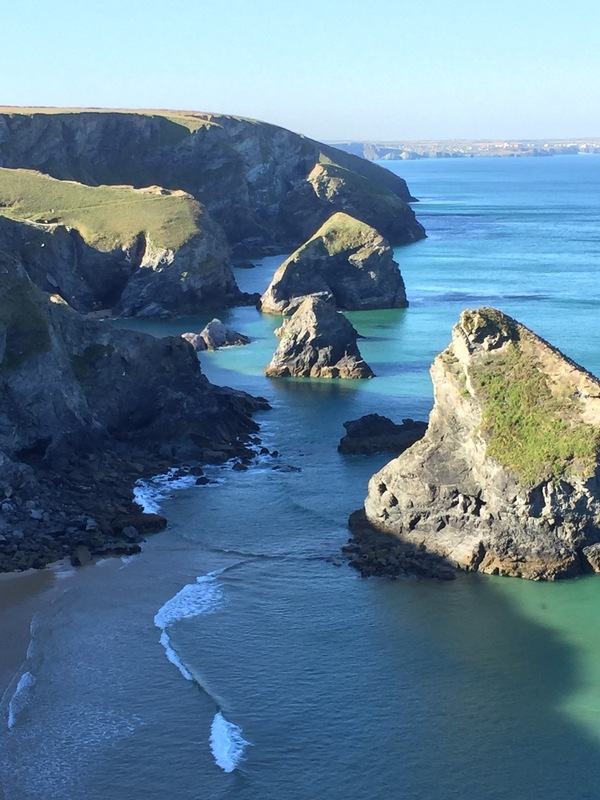 Cornwall at it’s best – glorious. 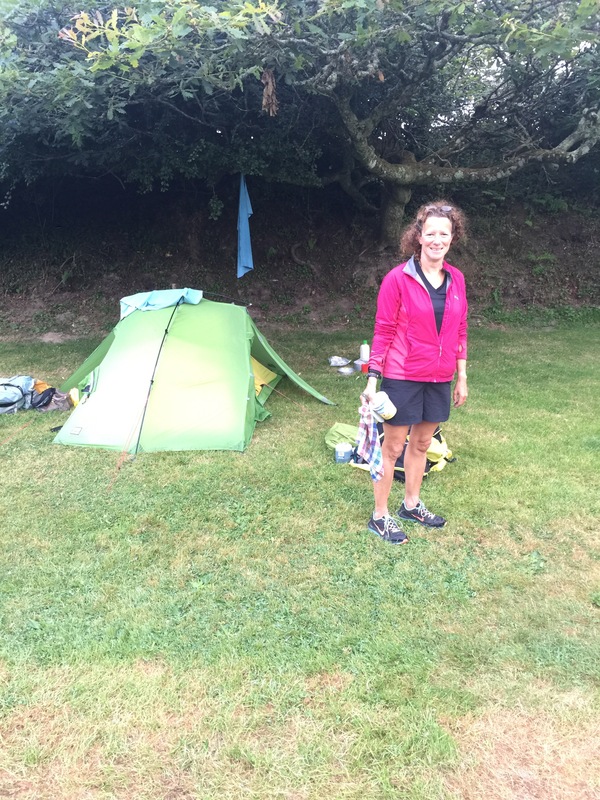 Distance miles 17.82 , cumulative 1,207.41 miles, time 8hrs 25mins, walking time 6hrs 35mins, pace 2.7 mph, camped Little Bodieve campsite. Today was our warmest day yet with bright sunshine and an eerie sea mist which drifted in and out. 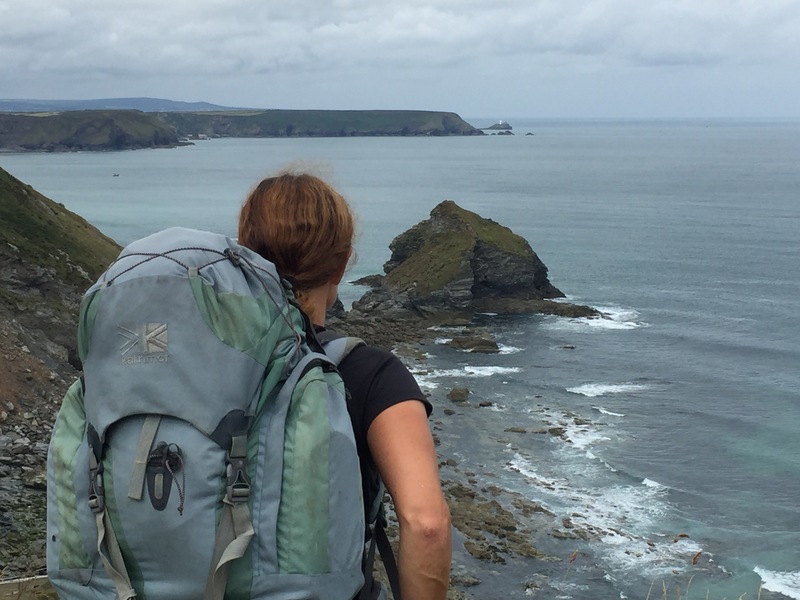 The switchbacks between Tintagel and Port Isaac are brutal and just keep coming one after another. We both got rather warm and a little sweaty. The cool mist when it drifted in became a welcome respite. 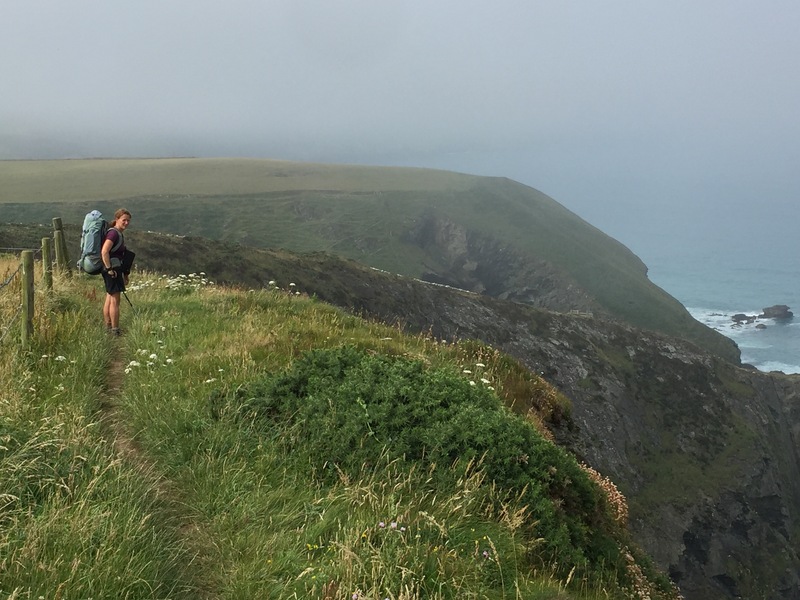 As we approached Port Isaac a number of walkers coming the other way asked us if we were Steve and Lynn and one young lad greeted us by saying congratulations. 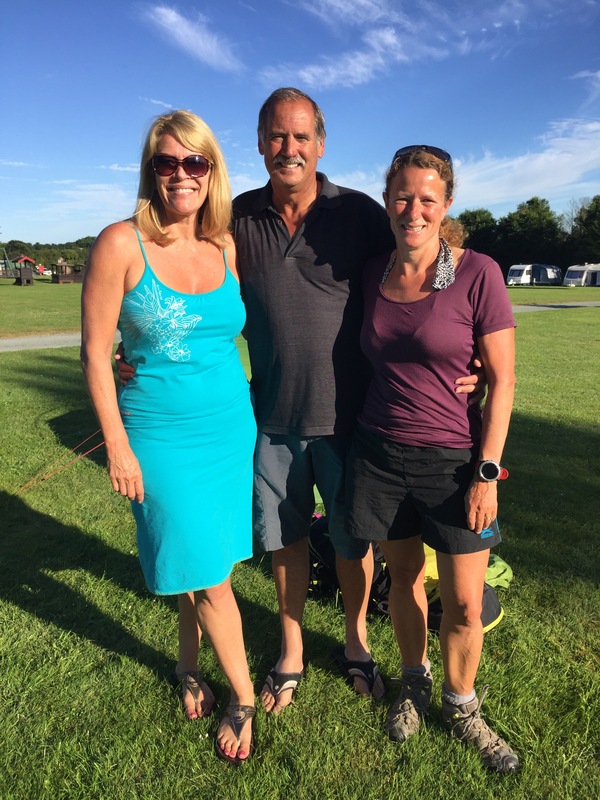 One group were adventure racers from Saltash and one couple Fez and Angela stopped for a chat. 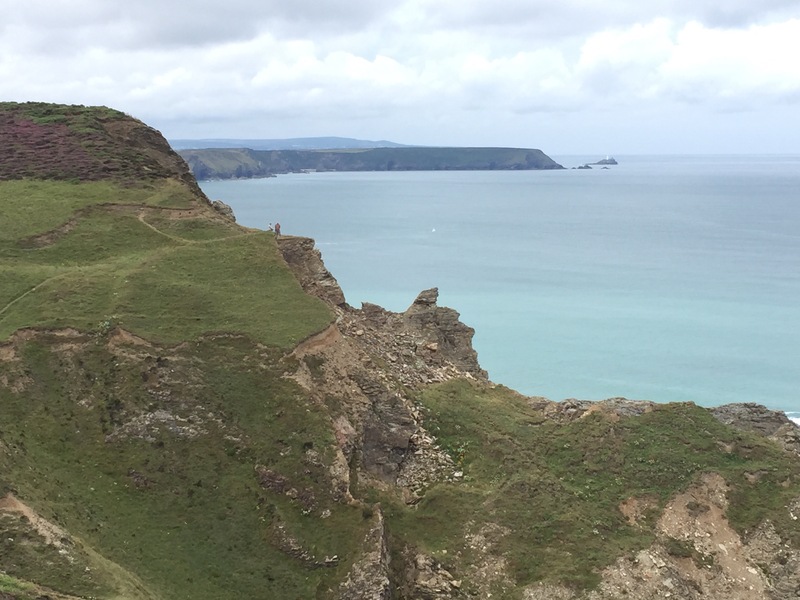 They were running from Port Isaac to Tintagel and trying to complete it in under 3 hours. 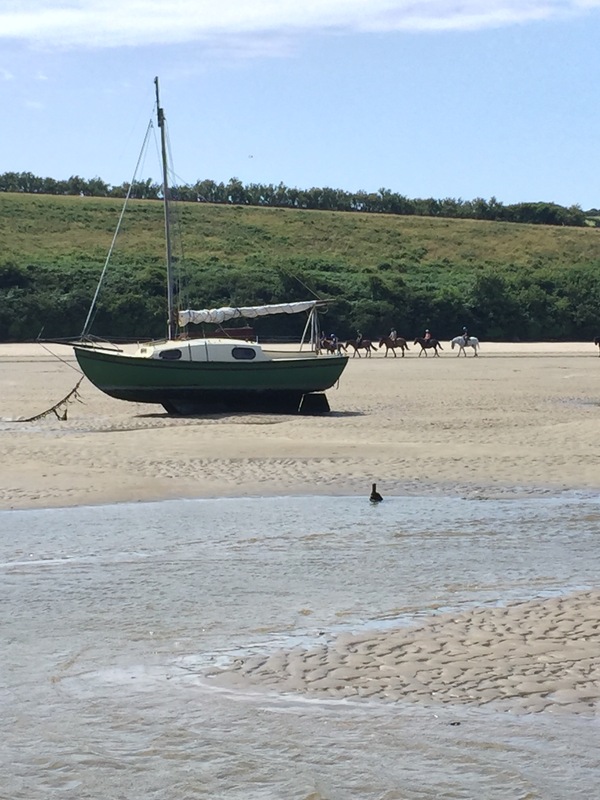 We saw little evidence of running – it was that kind of day, very hot. It turned out our friends Bob and Kath were in Port Gaverne and had been telling walkers on the path to keep an eye out for us. We reached Gaverne to find Bob and Kath outside the pub. We joined them for a coffee and a natter. It was great to see them. Bob had taken Steve up in his plane as a retirement treat. Steve had not been confident of getting the plane off the ground but, had he been allowed, he was very confident he could have got it back down. 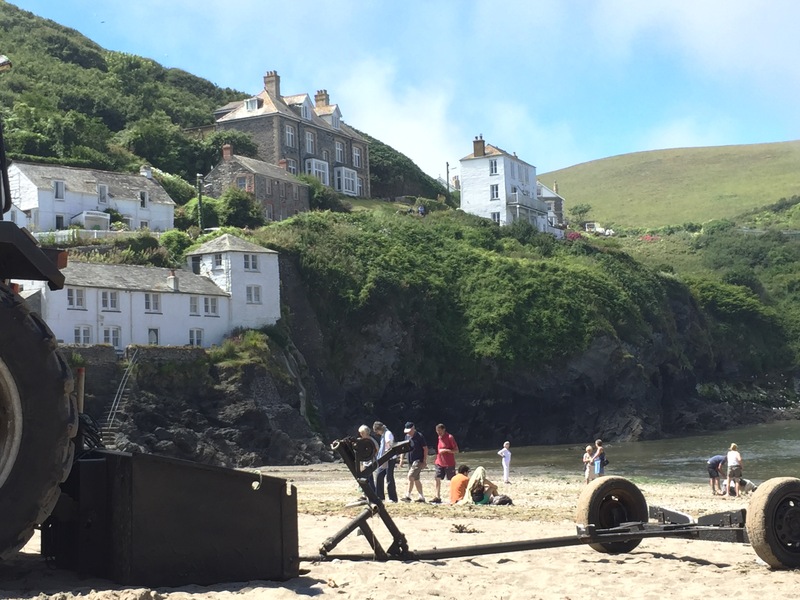 We said goodbye to them and we headed into Port Isaac passing the visitors on the Doc Martin ‘locations trail’ to eat our lunch sat by the slipway in the glorious sunshine. 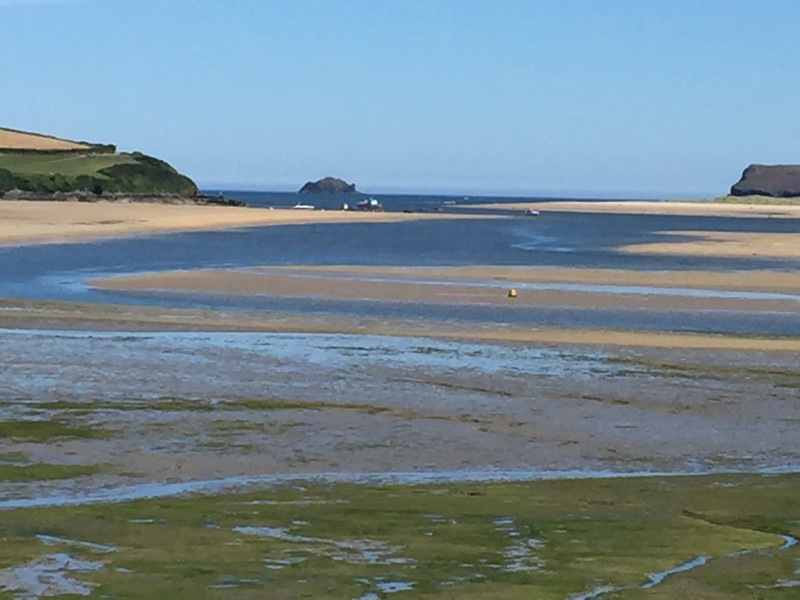 We headed inland towards Wadebridge following country lanes until we reached Chapel Amble where we enjoyed a long cool drink at the Maltsters. 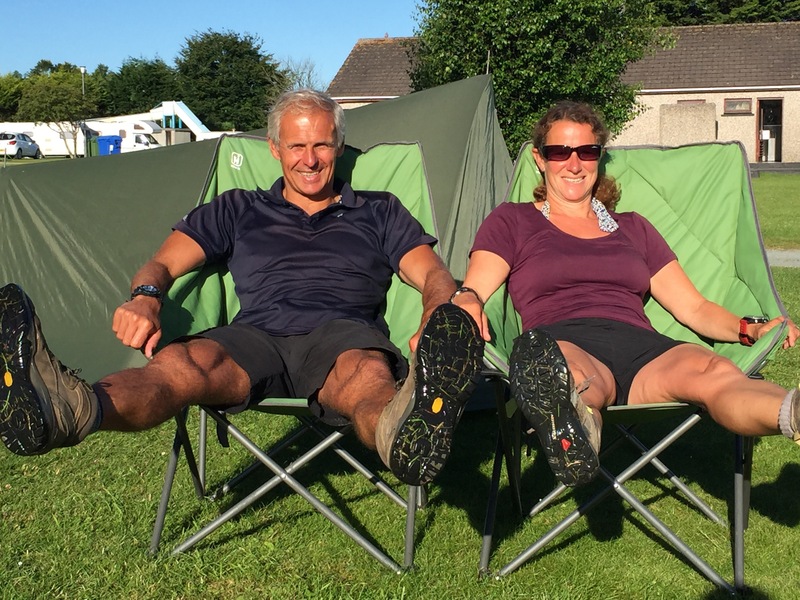 We crossed a few fields re-establishing a few unused footpaths and finished the day on a busy stretch of road to the campsite, where friends John and Sam were already waiting for us and we pitched beside their tent. We spent a very convivial evening catching up with them and enjoying the last of the sunshine. It has been great to be joined by friends during our final week. John has been keeping an eye on our house. 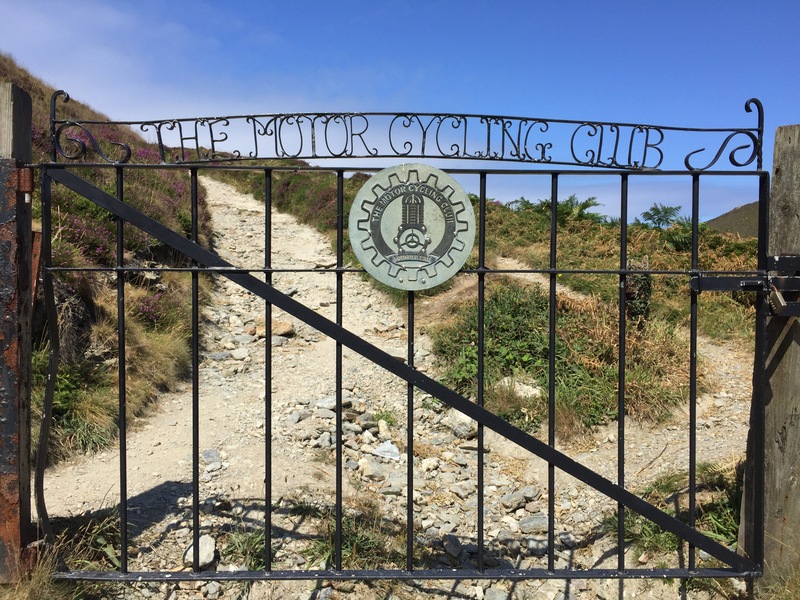 We dread to think what state it is in – he did mention that the Council had erected ‘Herres’ fencing around it and were insisting immediate work was undertaken to make it safe. 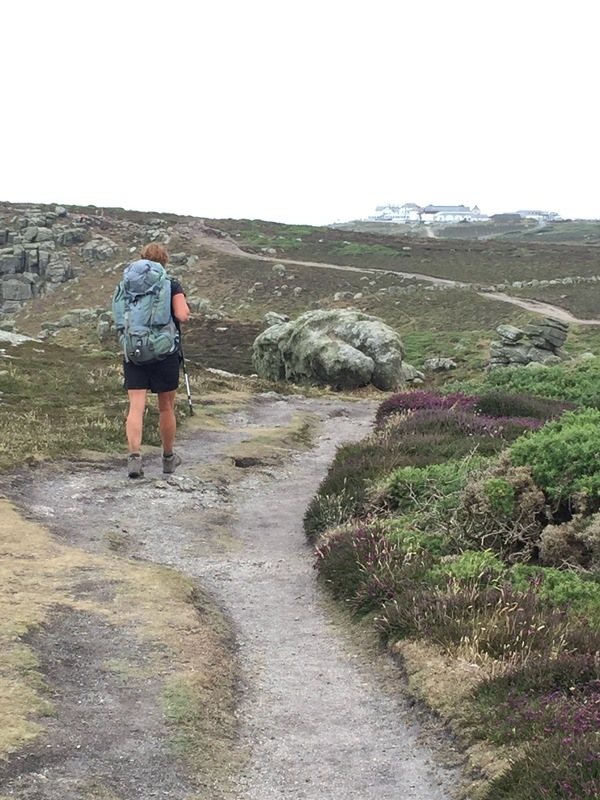 One of Steve’s boots has split today so the priority over the next few days is get them replaced to see us through to Land’s End before they completely fall apart. One of the joys of writing the blog has been reading your comments. 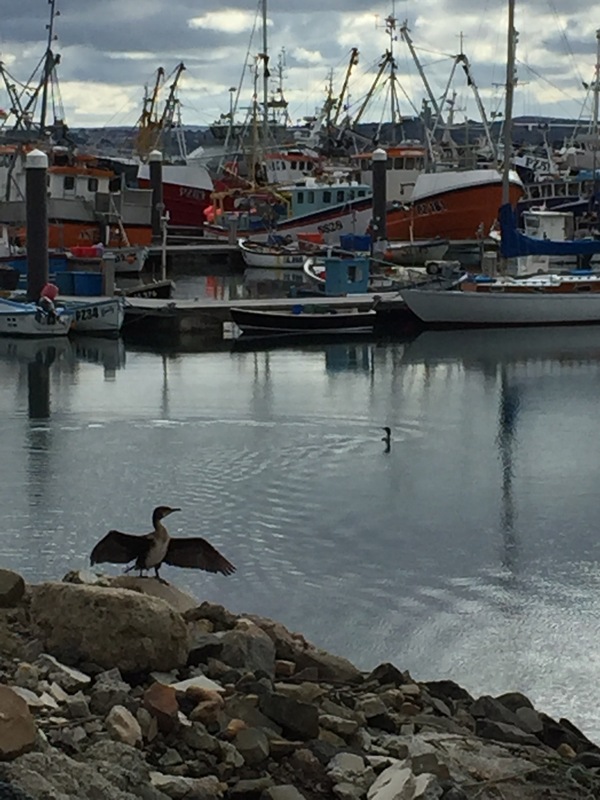 If you are looking at this blog then please click on ‘comments’ and leave a few words, even if only to say hello and leave a name and where you are from. As it is our final week it would be good to hear from you. To date we know we have had 572 different people view the log so do let us know if one of them is you. Your comments have helped to motivate us and added to the joy of this adventure.